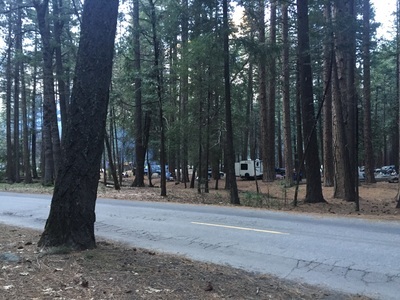 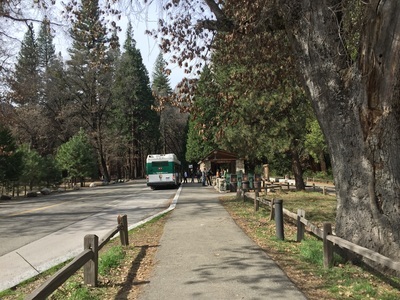 NOTE: coming from the Bay Area, cell service drops out after Mariposa and does not resume until a couple miles into the park (about a 50 minute drive). I recommend printing out information, and stopping in Mariposa for phone calls. 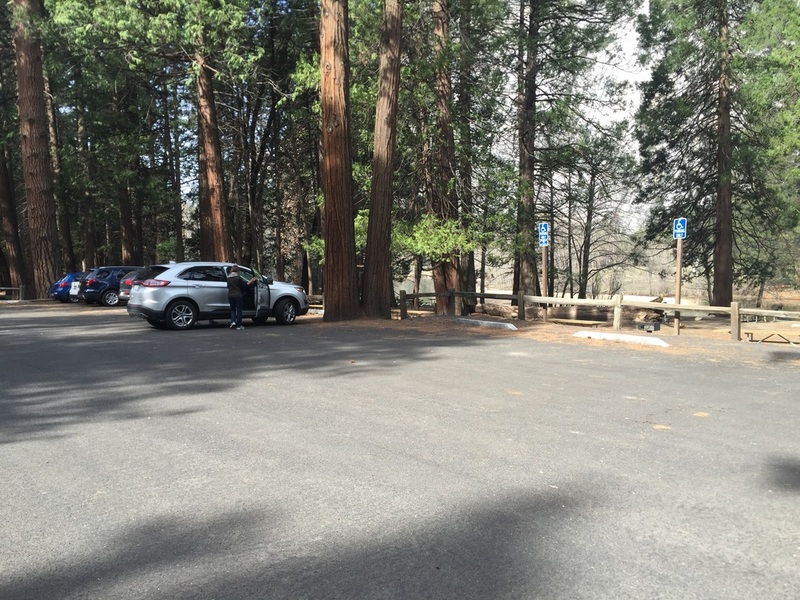 Parking: $25 vehicle fee November- March, $30 April-October (pass is valid for 7 days). $60 for an annual pass. 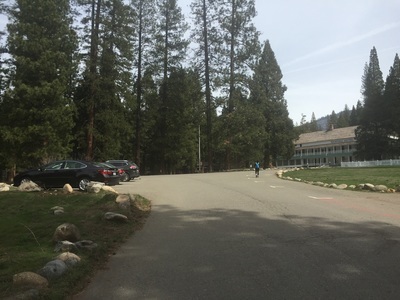 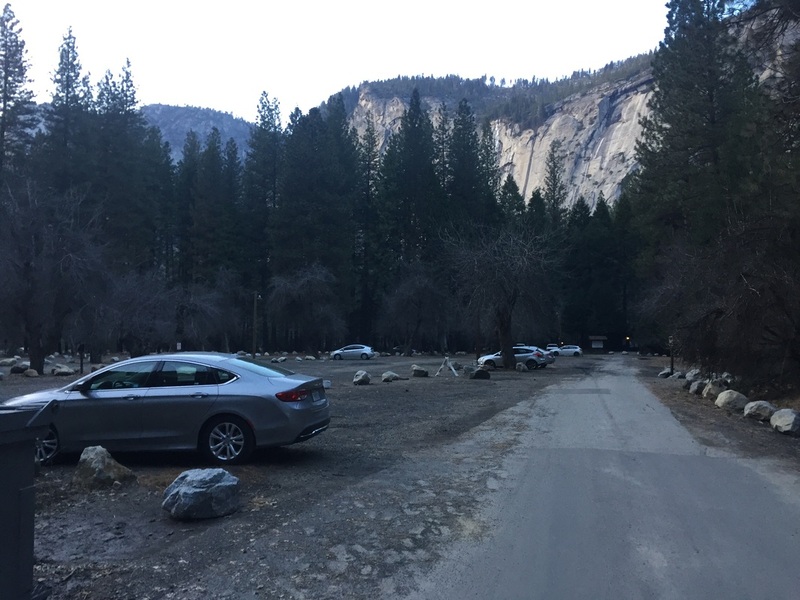 Multiple parking lots available within the park. 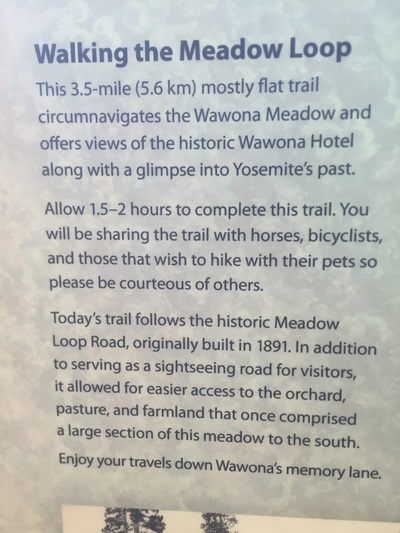 Regulations: Dogs on a maximum 6-foot leash. 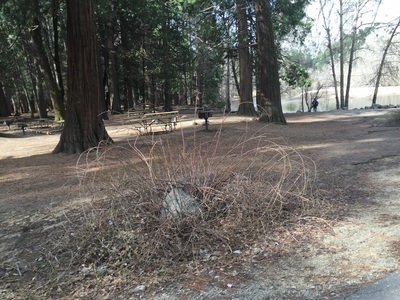 Owners must clean up after pets. 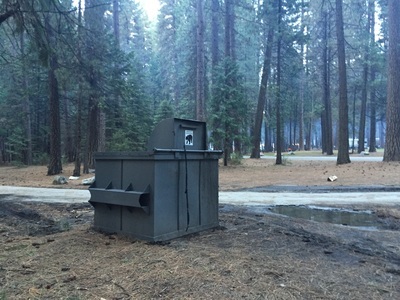 Store pet food in bear-proof containers. Best time to visit: Early spring, when the wildflowers are in full bloom, you’ll enjoy cool weather and may even see some snow on the mountain tops. Do not take your dog in summer or on a hot day. 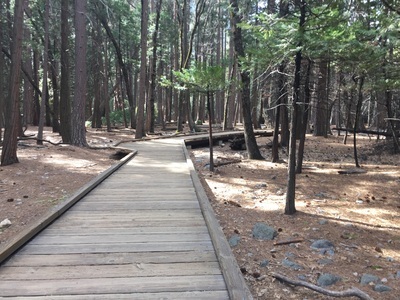 Temperatures can soar to 100 degrees, and pavement is too hot under your dog’s paws. 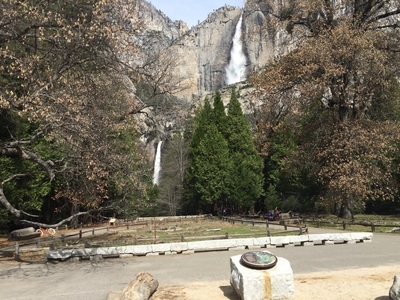 Mirror Lake and most of the waterfalls are dry during summer as well. 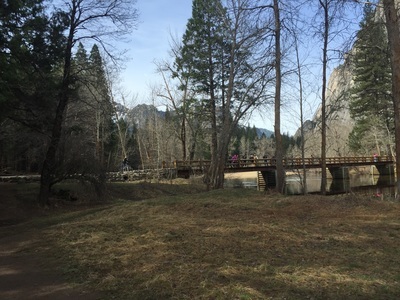 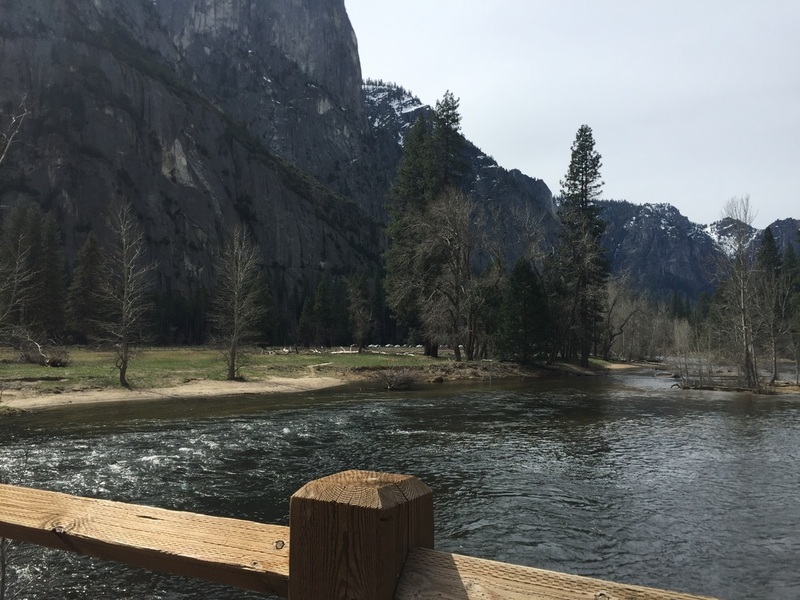 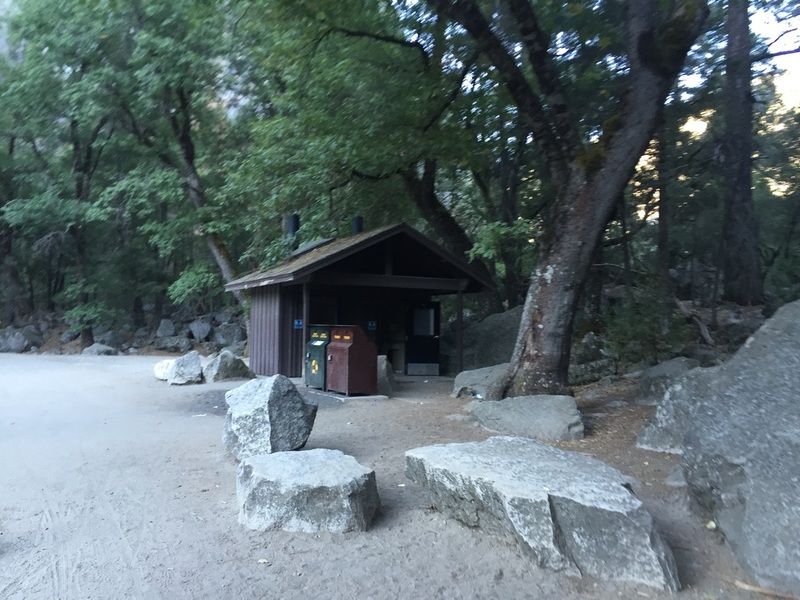 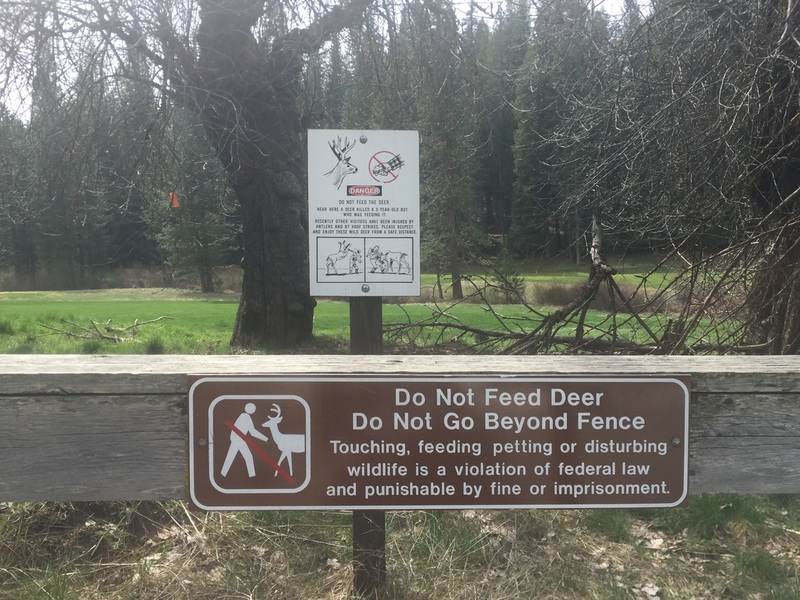 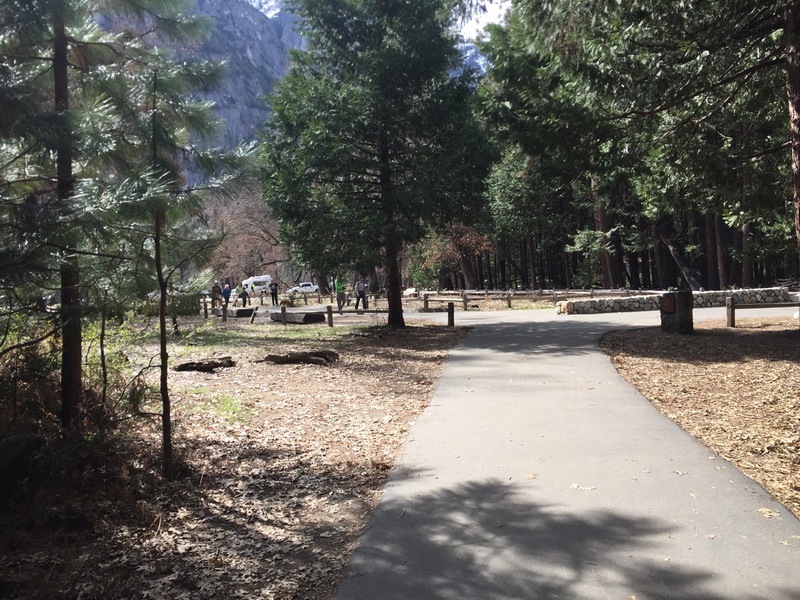 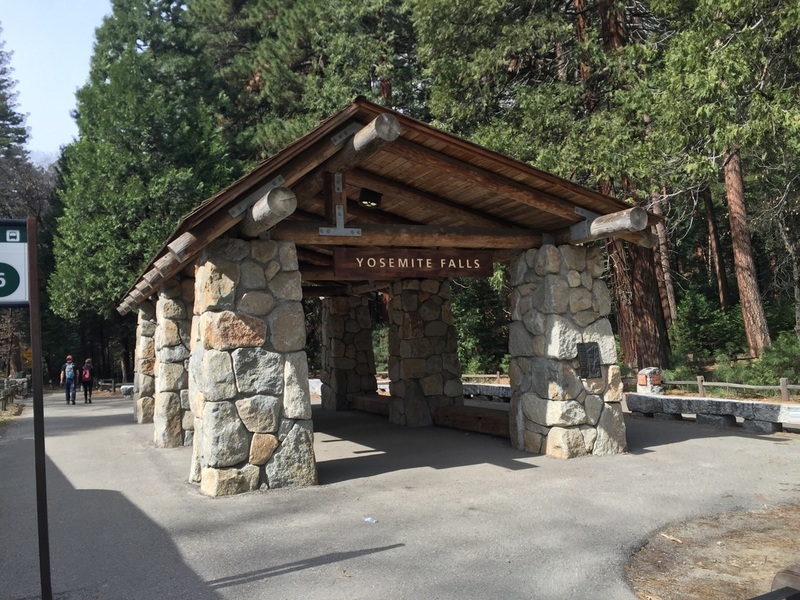 During my recent trip to Yosemite, I scoped out all the dog-friendly spots, and was pleasantly surprised by how much of the park allows dogs. 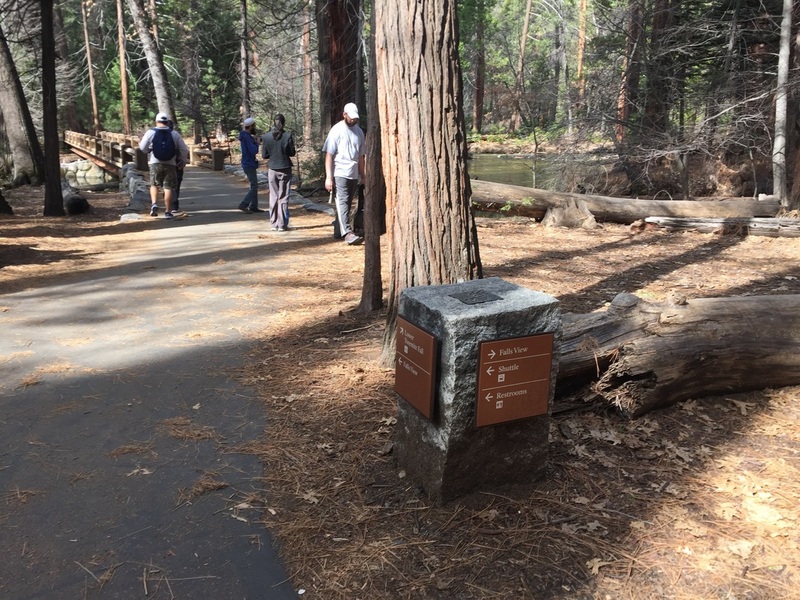 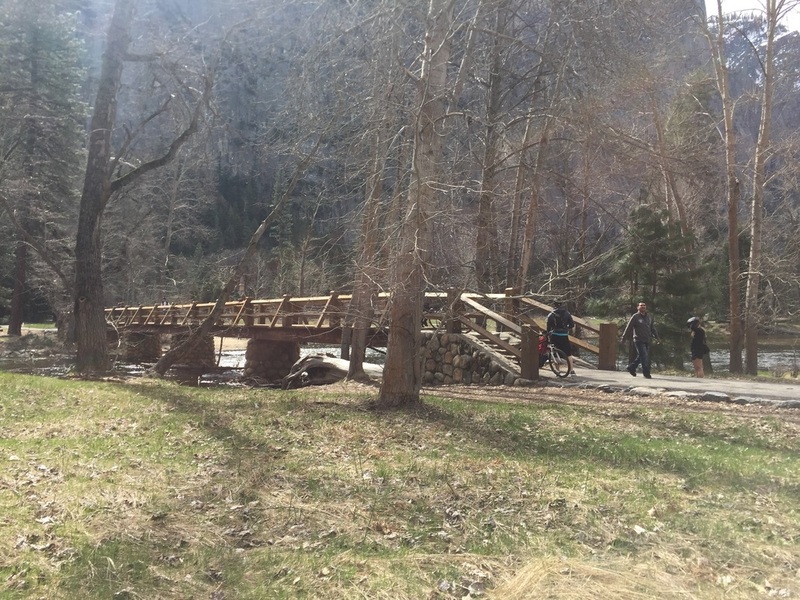 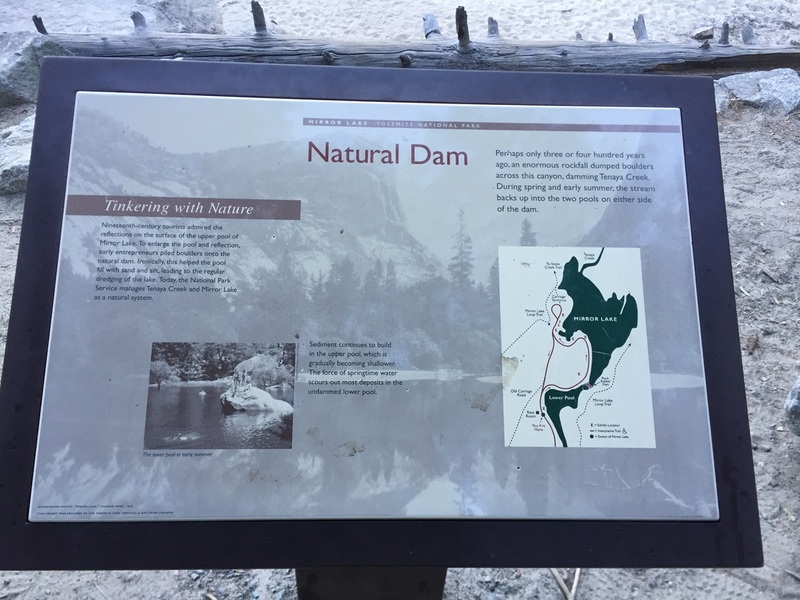 Most guides say dogs are allowed on “paved trails and developed areas,” but you probably don’t realize how much of the park falls under this description until you visit and go looking for it. 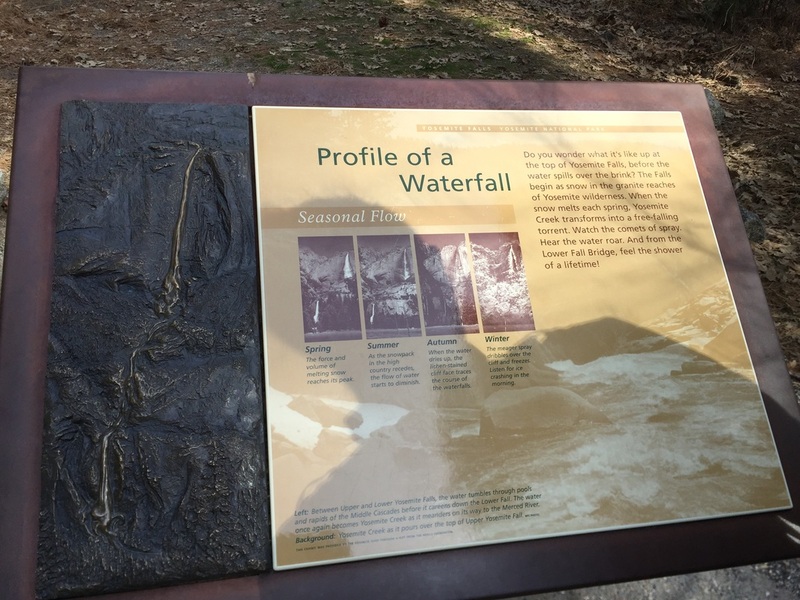 Unfortunately you won’t be allowed to hike to the top of any waterfalls, but there’s plenty to see with over 10 miles of paved trails. 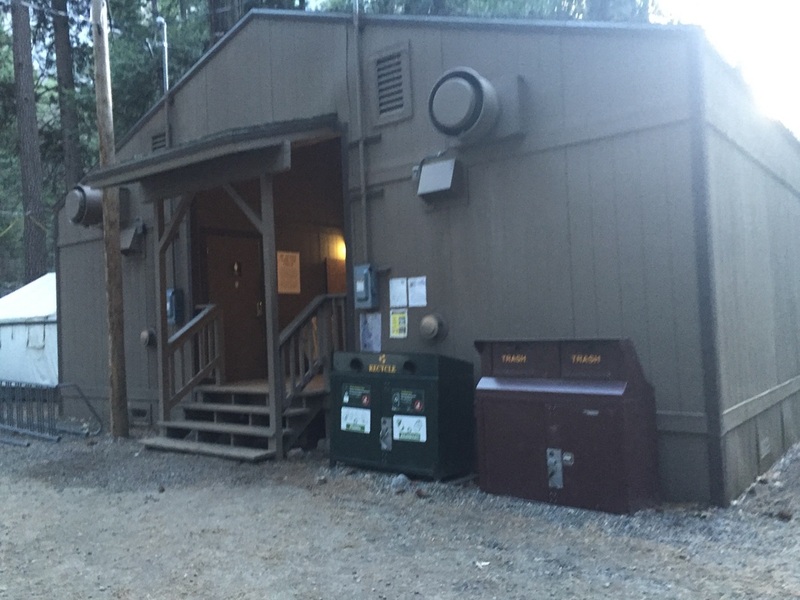 Dogs are not allowed in concessionaire lodging areas, so pack in your own food. 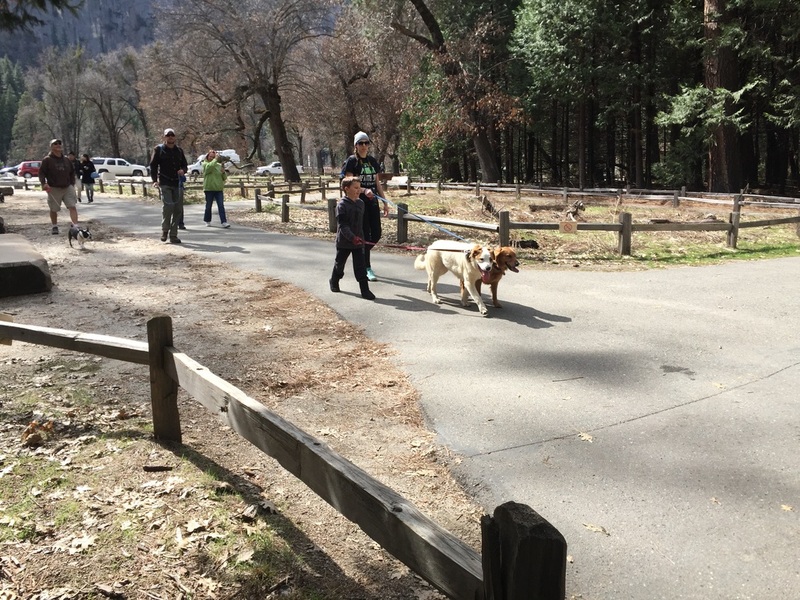 If you have kids, these paved trails are also stroller-friendly so if you’re looking for a leisurely family weekend, bring your dog along! 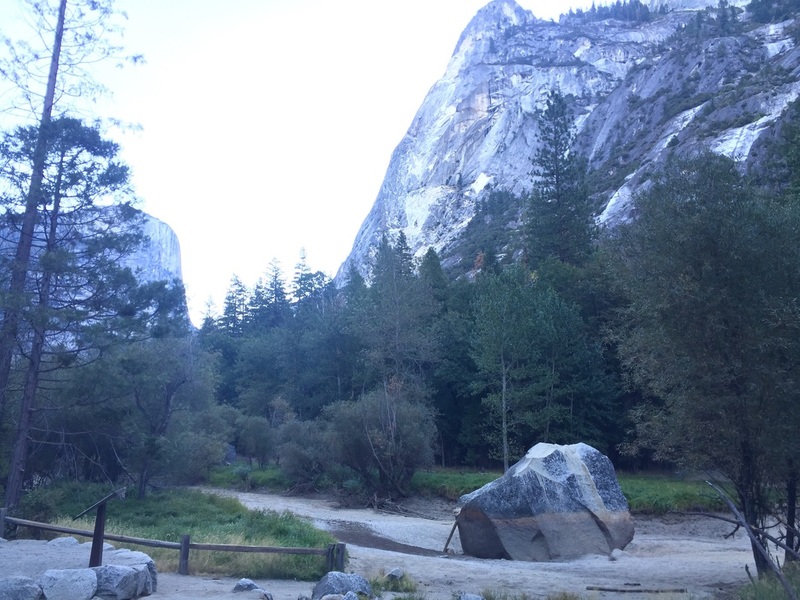 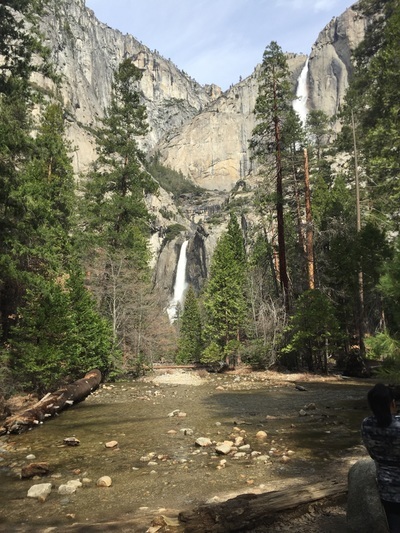 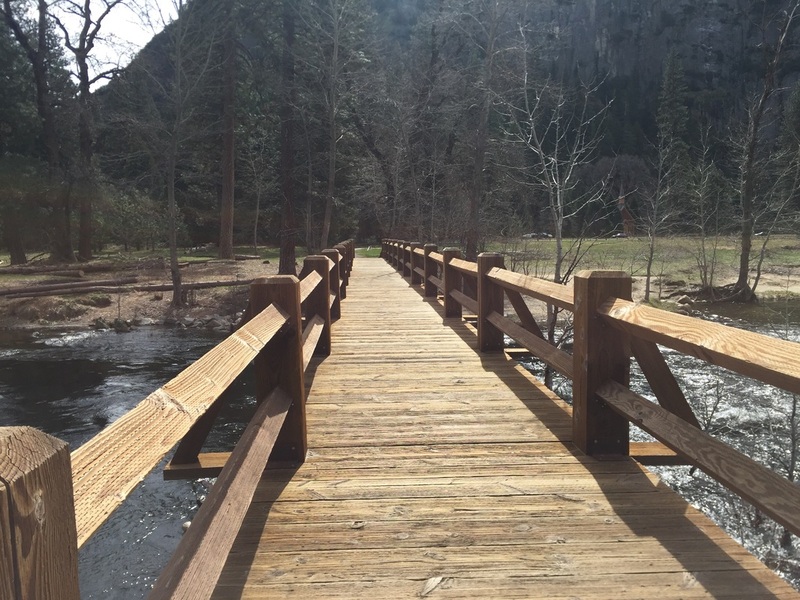 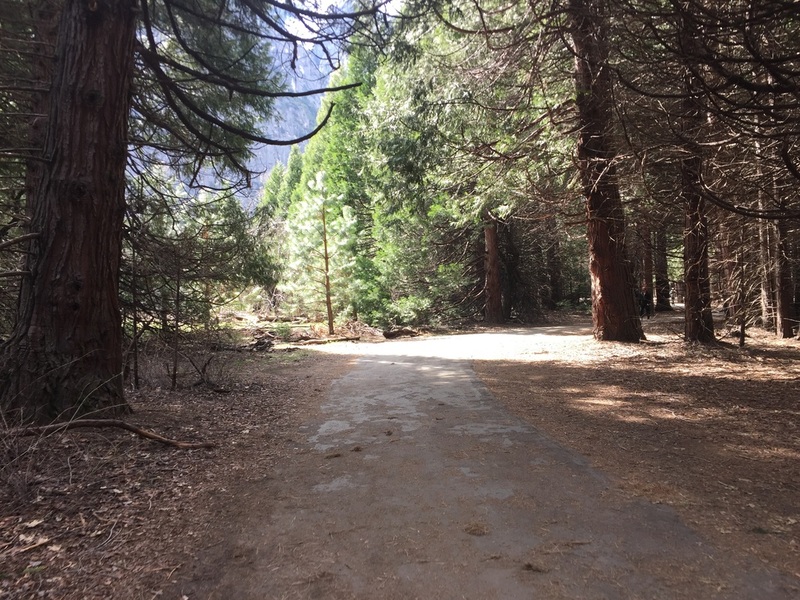 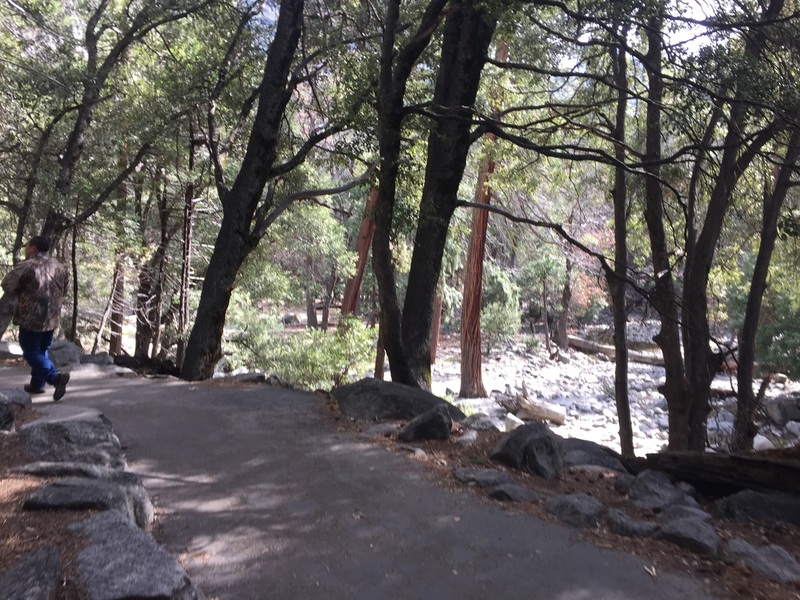 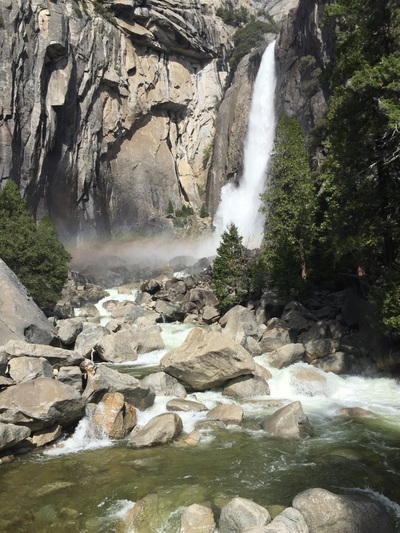 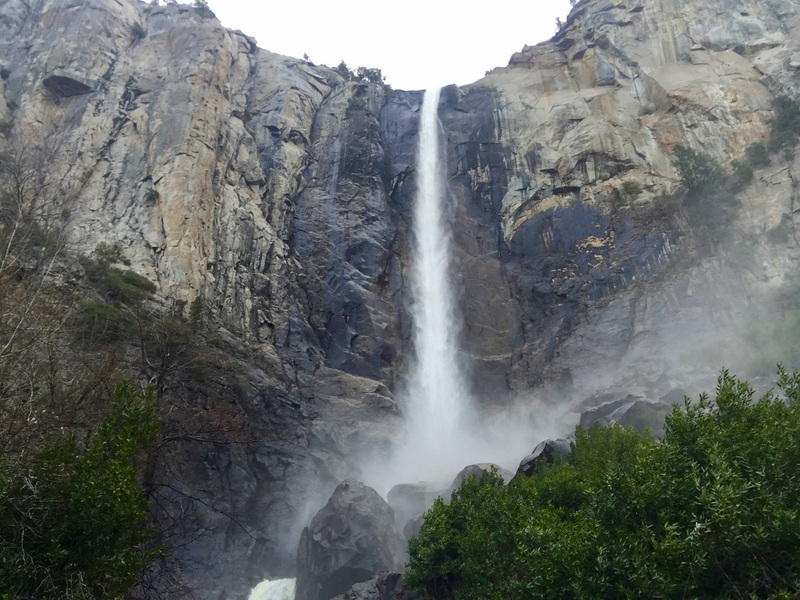 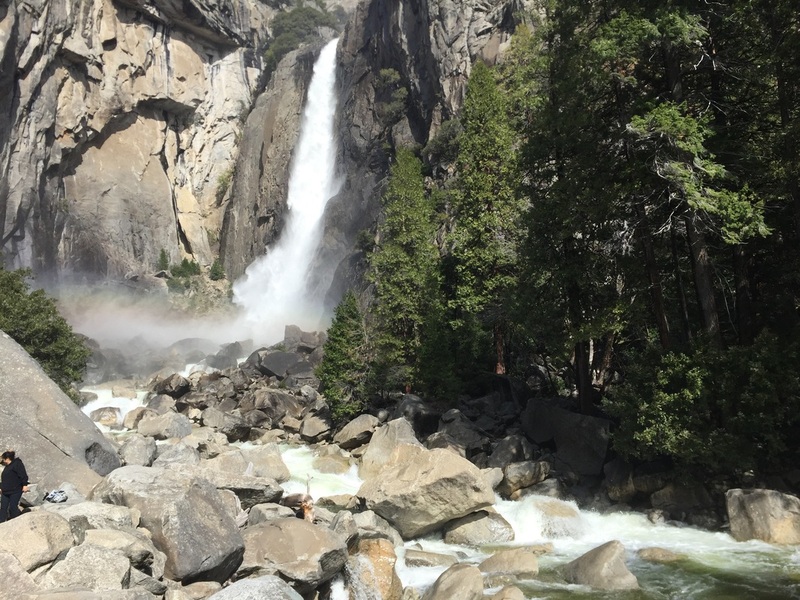 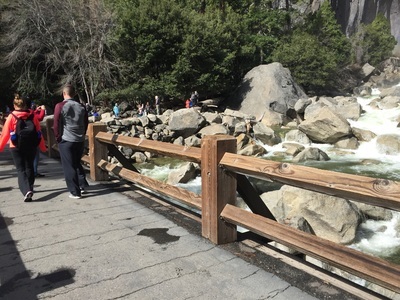 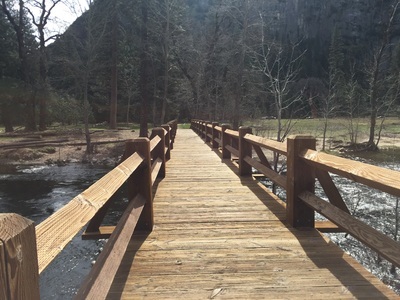 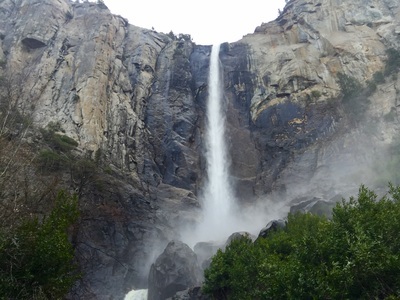 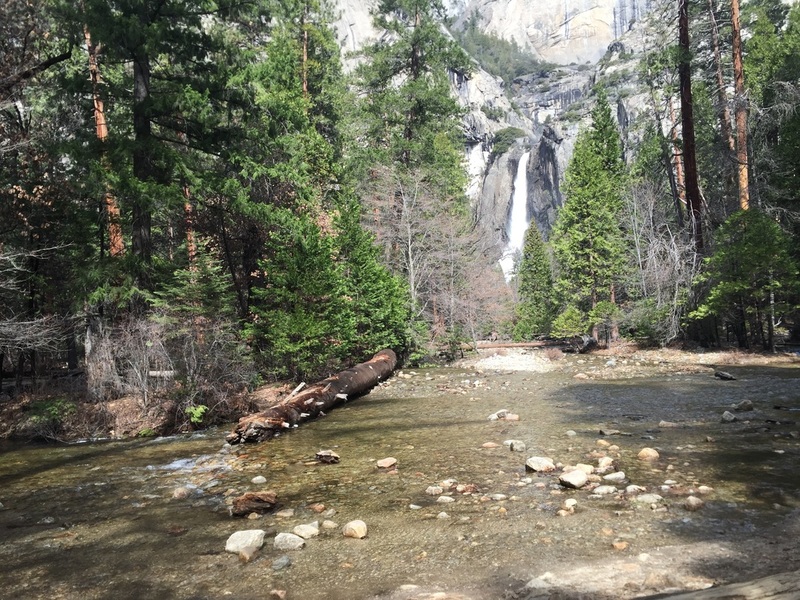 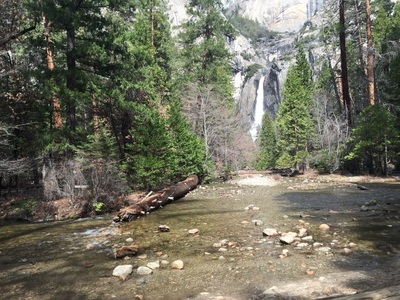 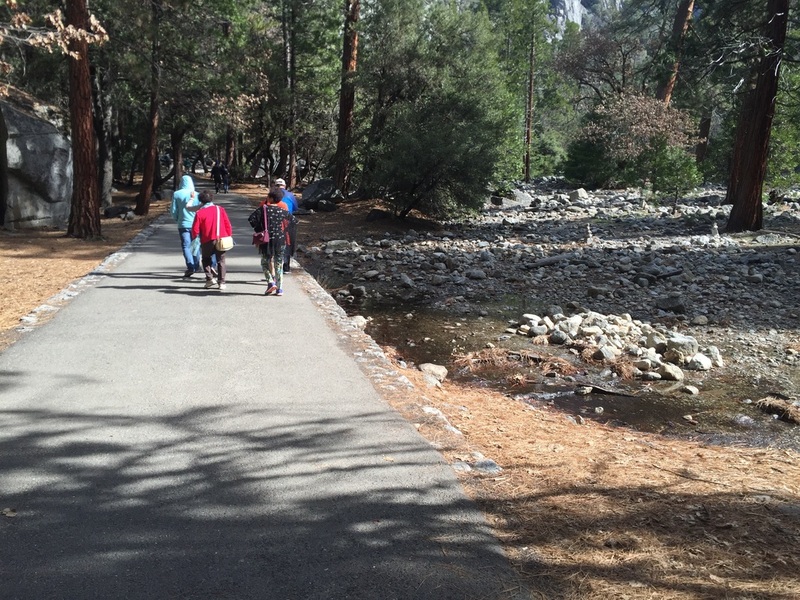 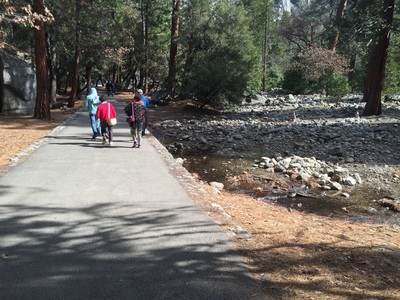 Bridalveil Falls: This 0.5 mile walk, with only a 20ft elevation gain, is short but scenic. 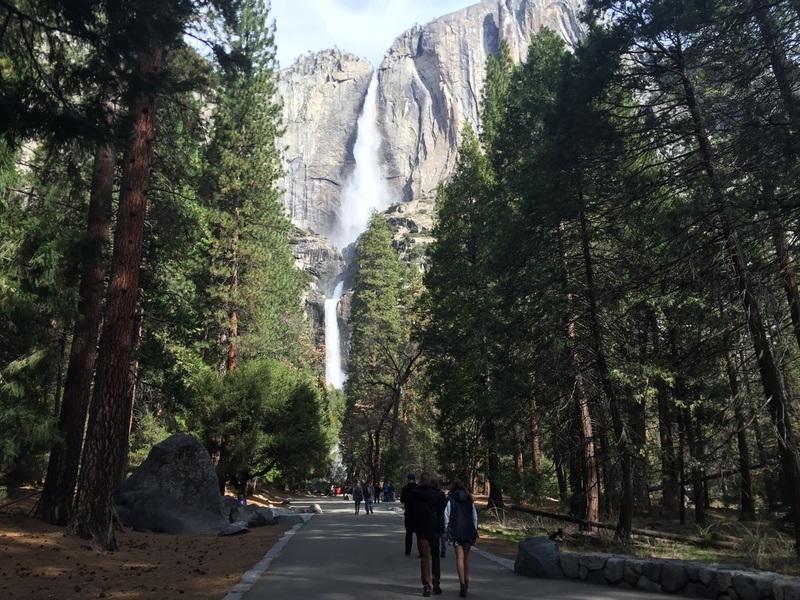 It leads you up to the base of the breathtaking 617-ft waterfall. 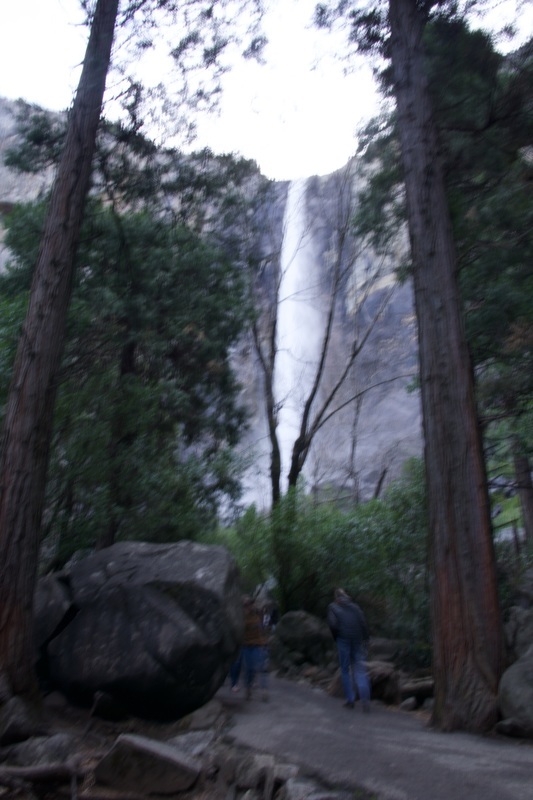 You’ll get a little wet at the base from all the mist, which makes it even more picturesque. 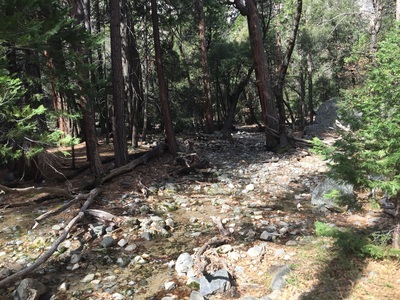 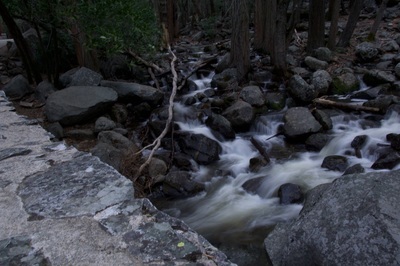 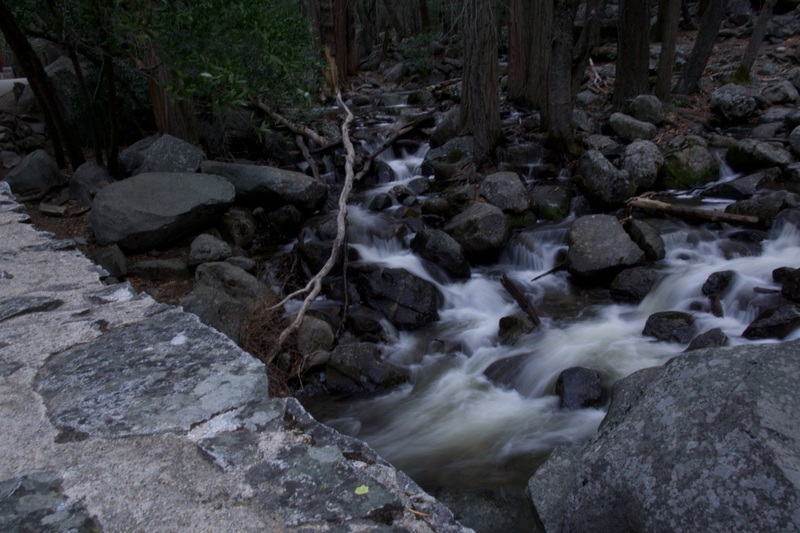 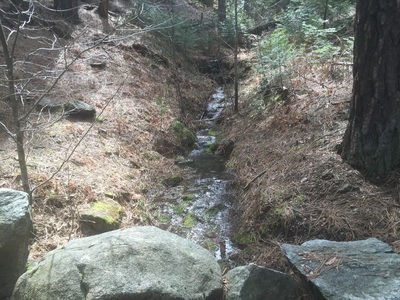 During your walk up, the trail is adjacent to the roaring creek, in full force with runoff from the waterfall. 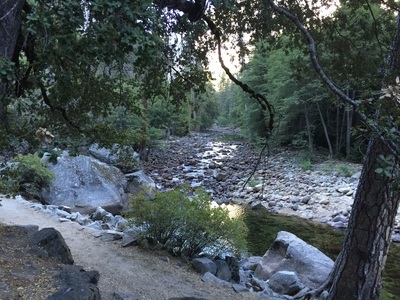 The creek itself is a place to stop for pictures. During summer this waterfall will most likely be dry, so visit during spring or summer to view the waterfall. 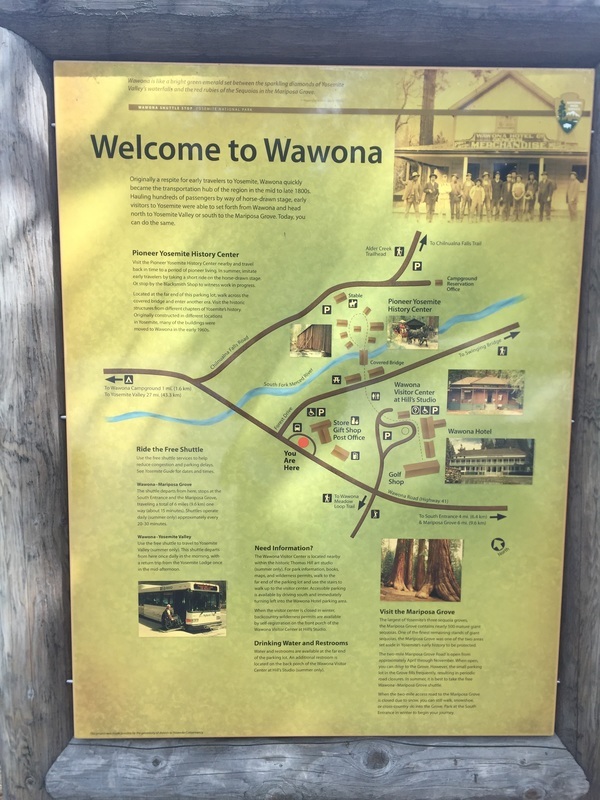 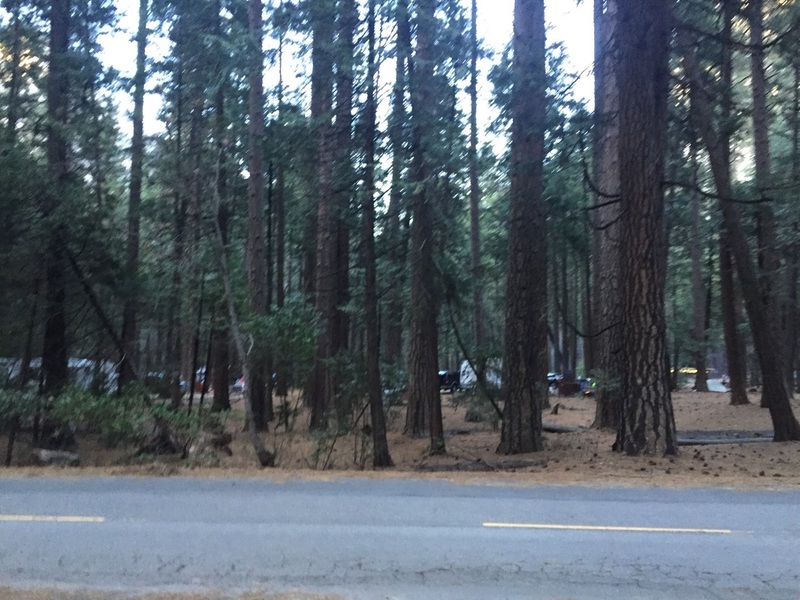 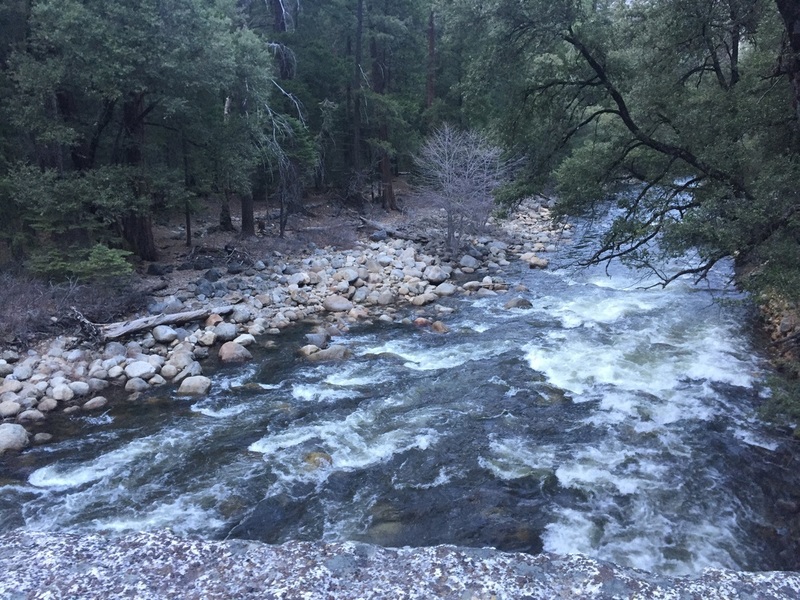 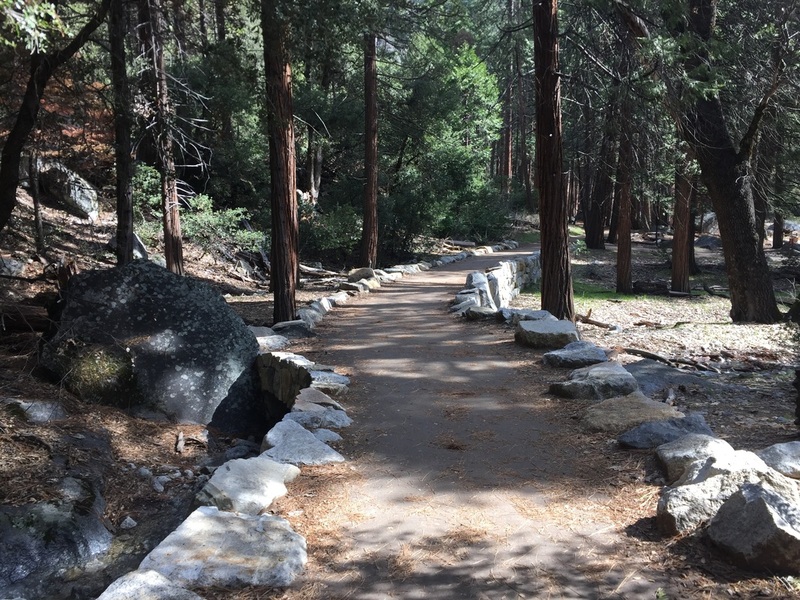 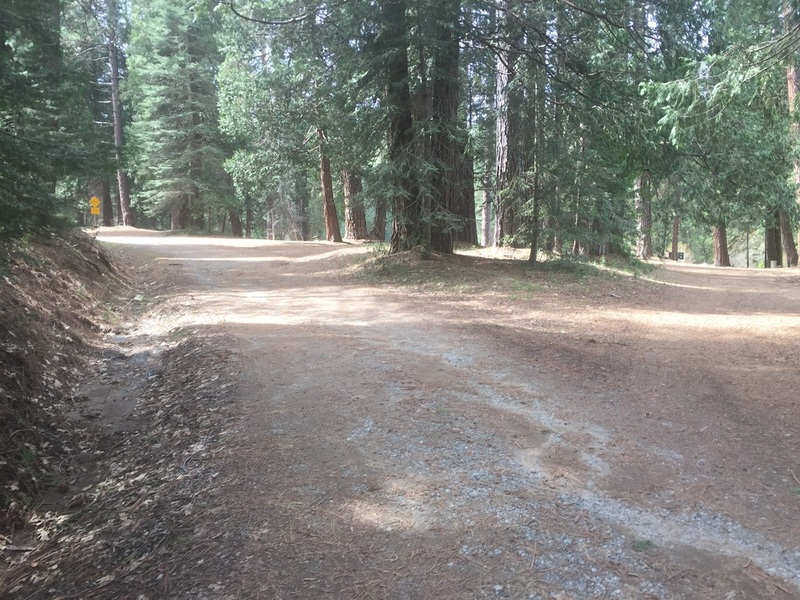 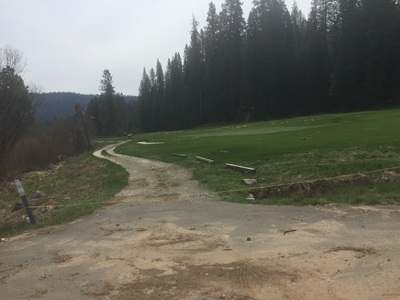 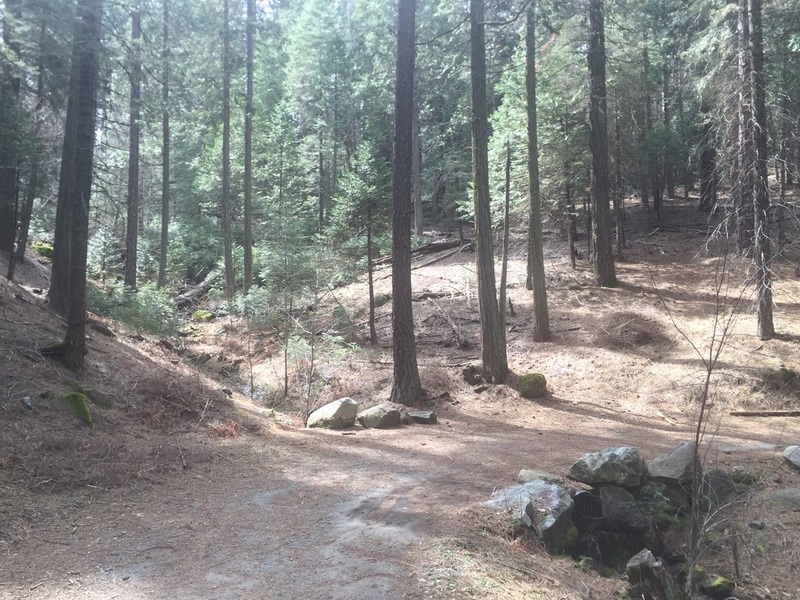 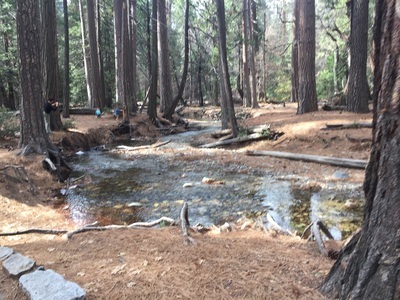 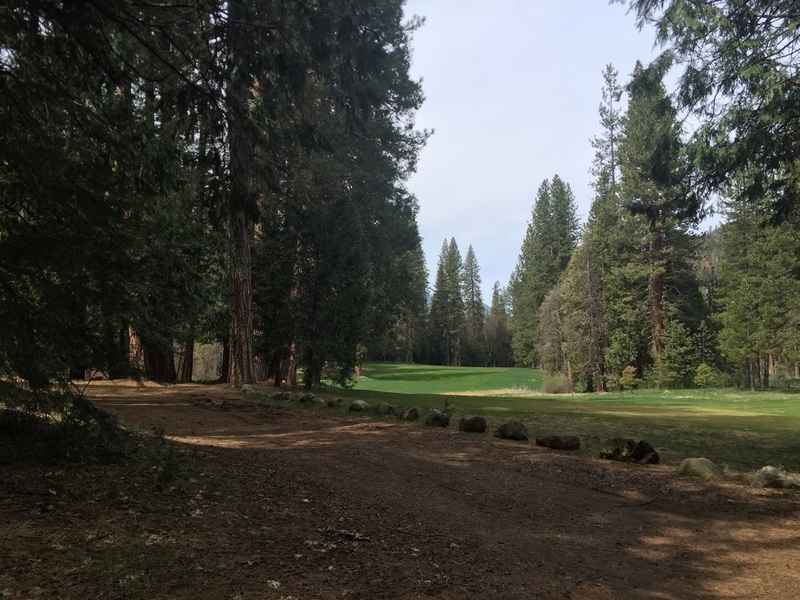 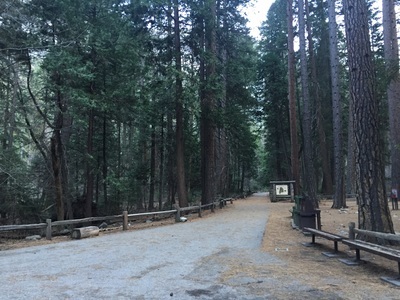 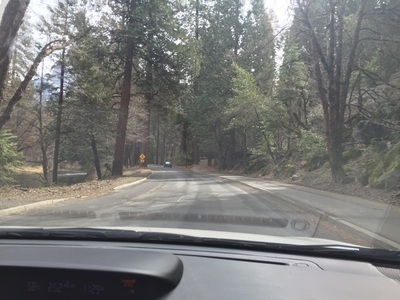 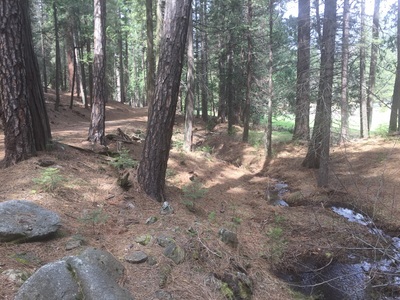 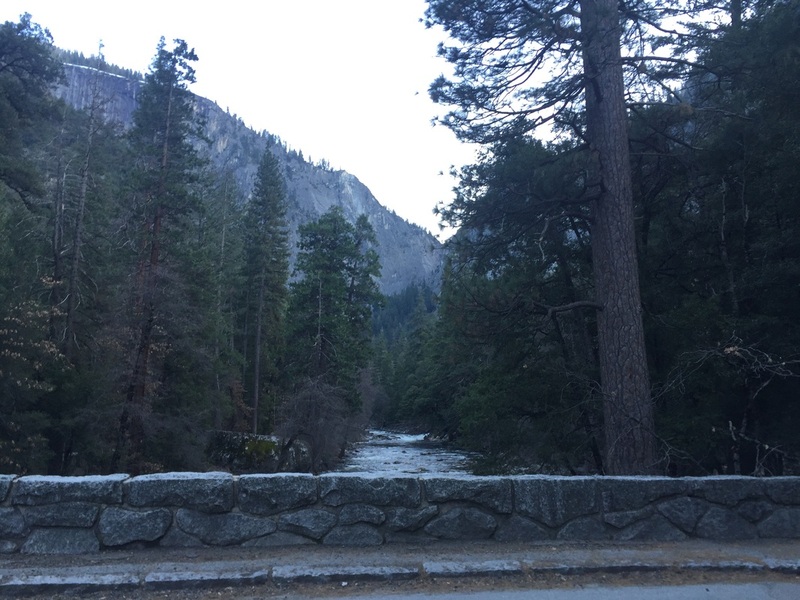 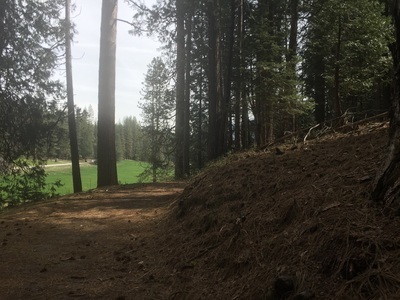 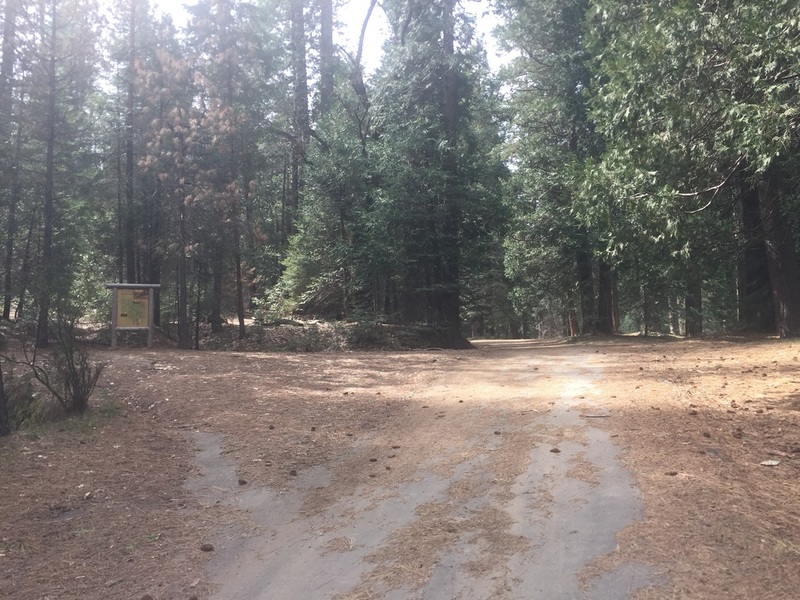 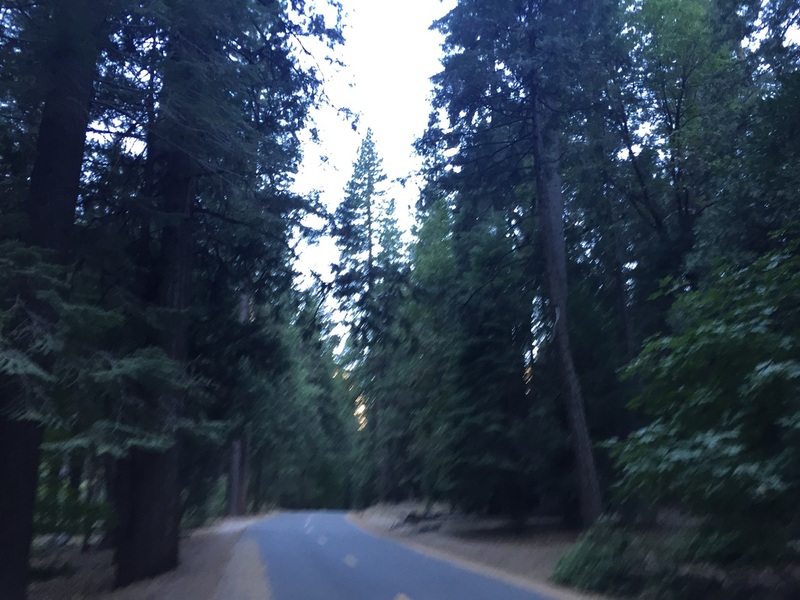 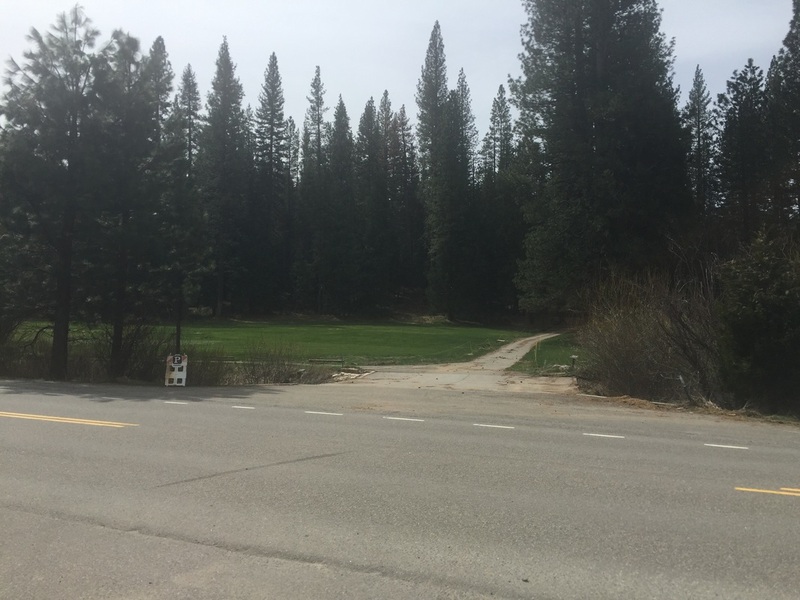 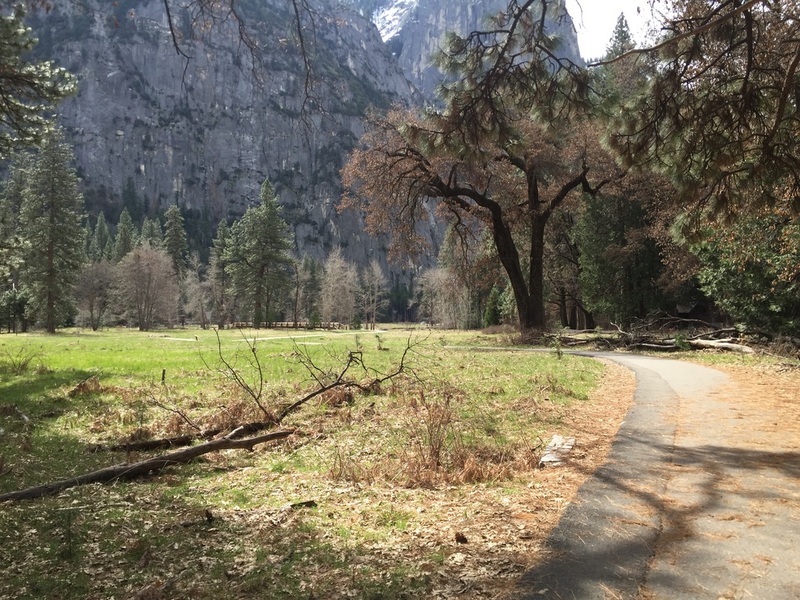 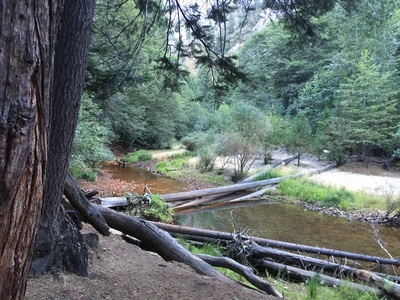 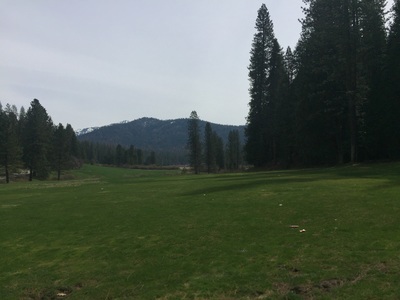 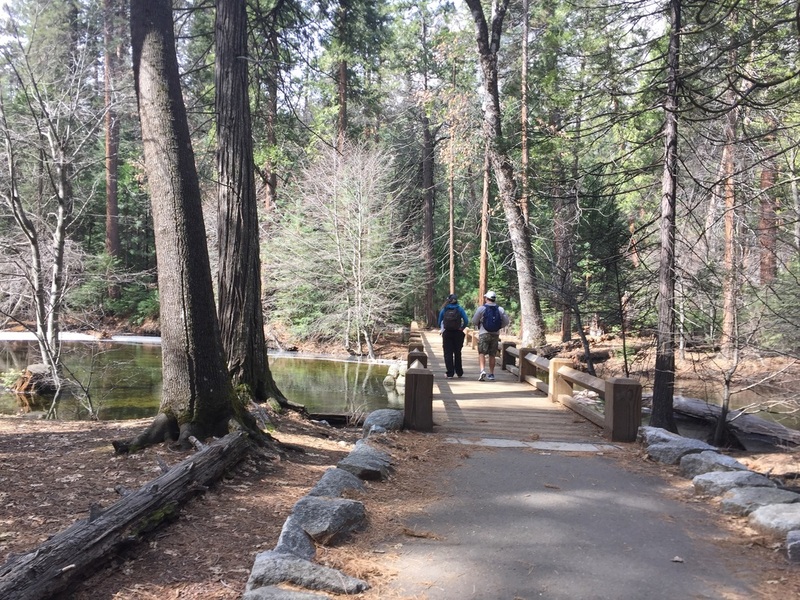 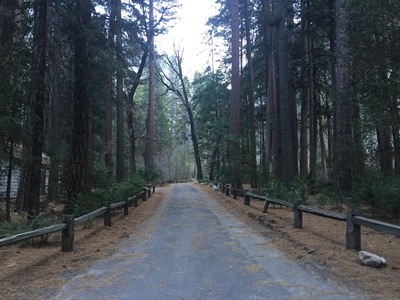 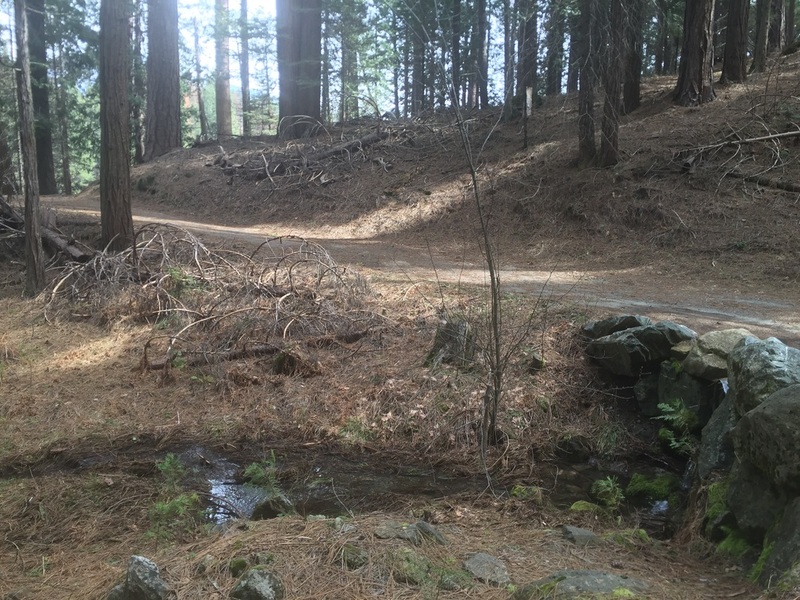 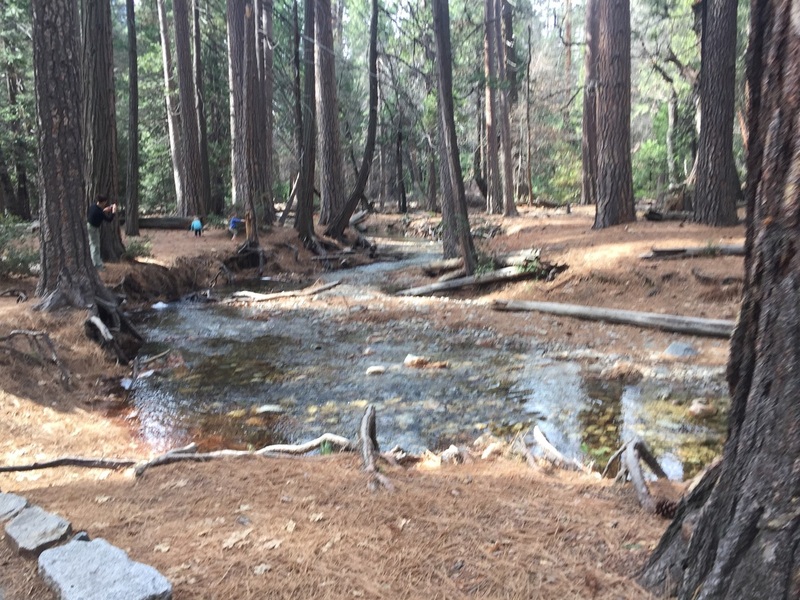 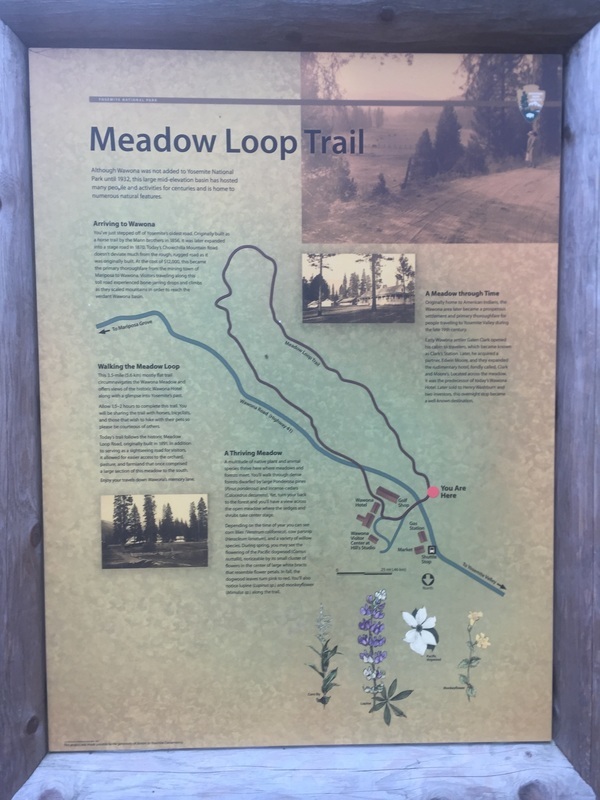 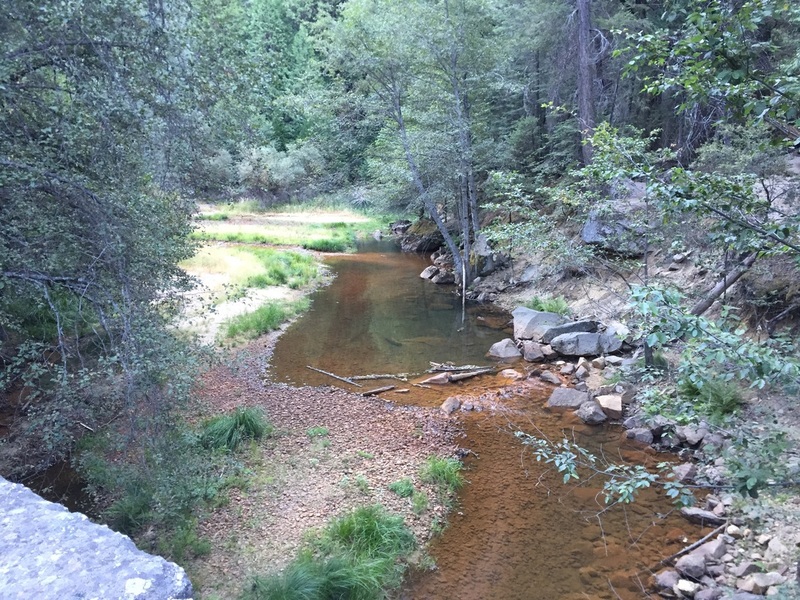 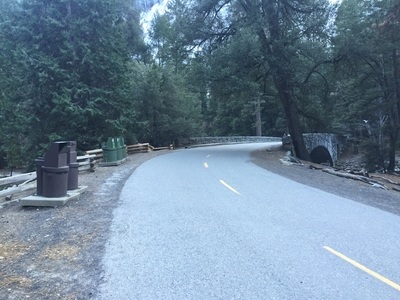 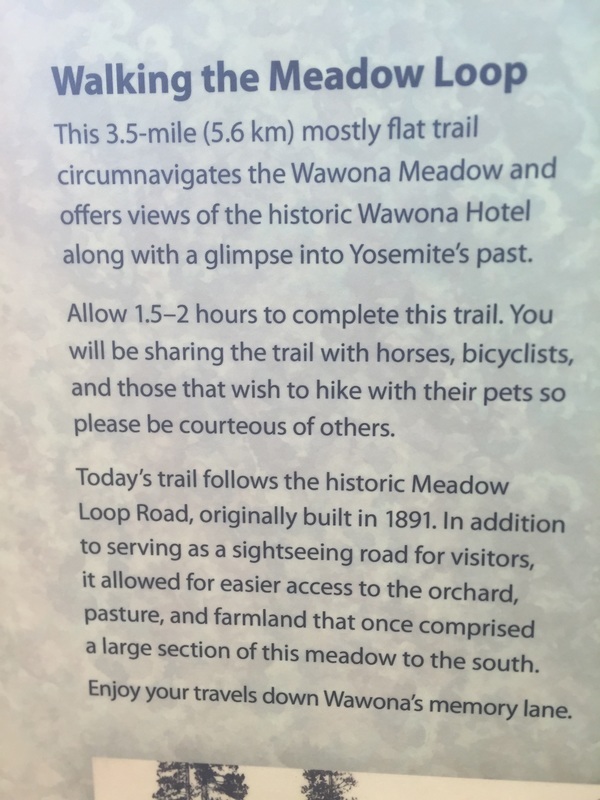 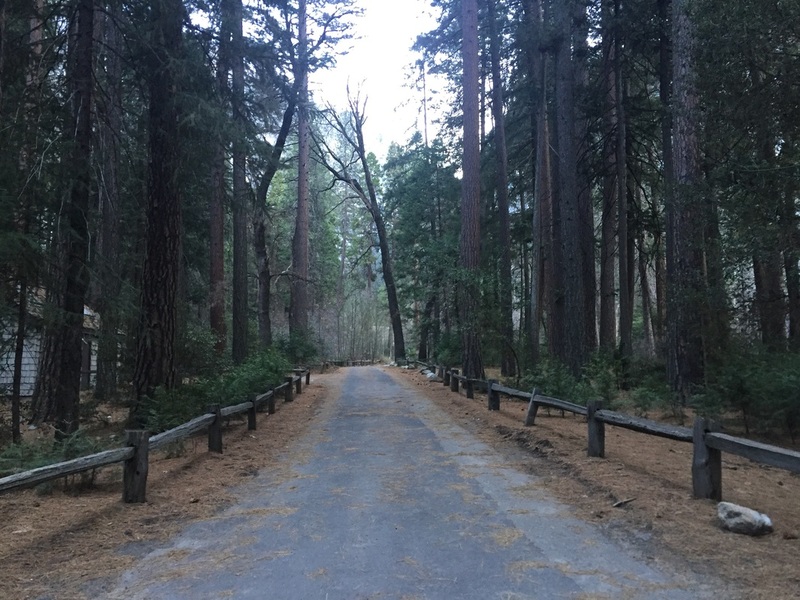 Wawona Meadow Loop: This is a gorgeous 3.5 mile loop with only 500ft elevation gain and the best part is that it’s rarely crowded! 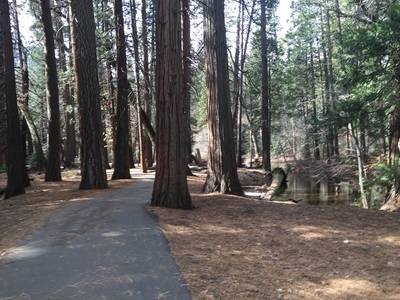 You’ll walk along a mostly shaded path, lined with towering trees and traversing a flowing stream. 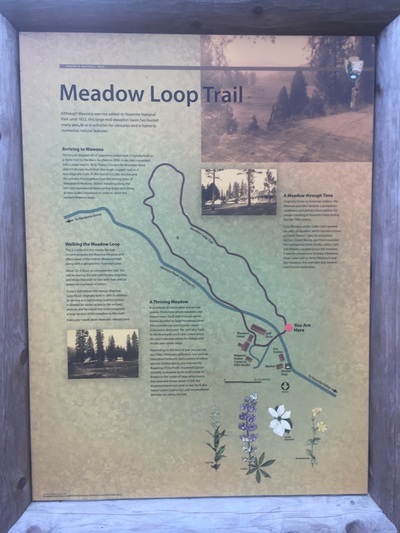 The trail loops around a beautiful green meadow, dotted with wildflowers. 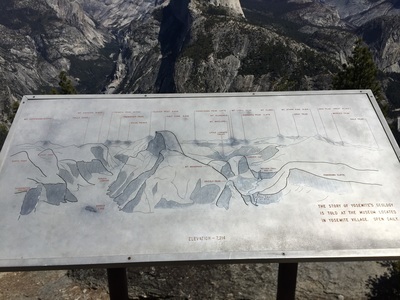 Glacier Point: Dogs are allowed on glacier point, as the parking lot is paved and the 0.7 mile trail to the lookout is paved. 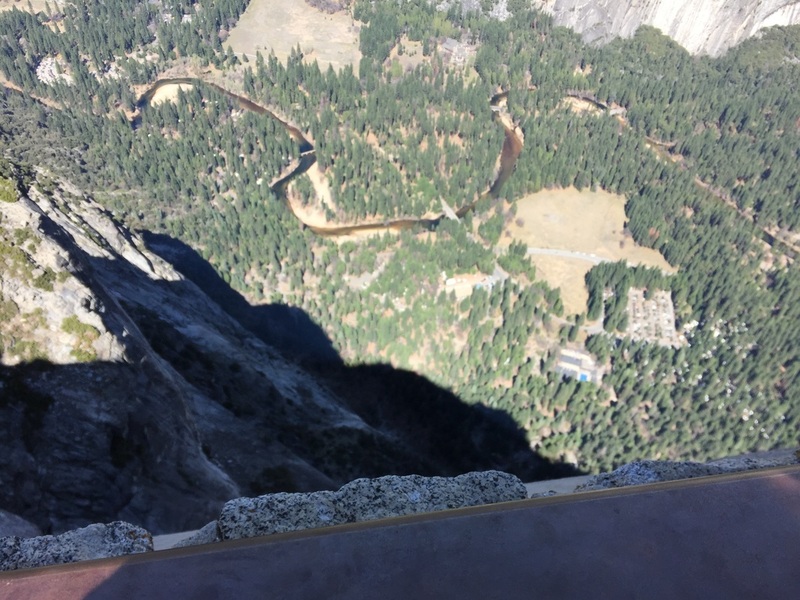 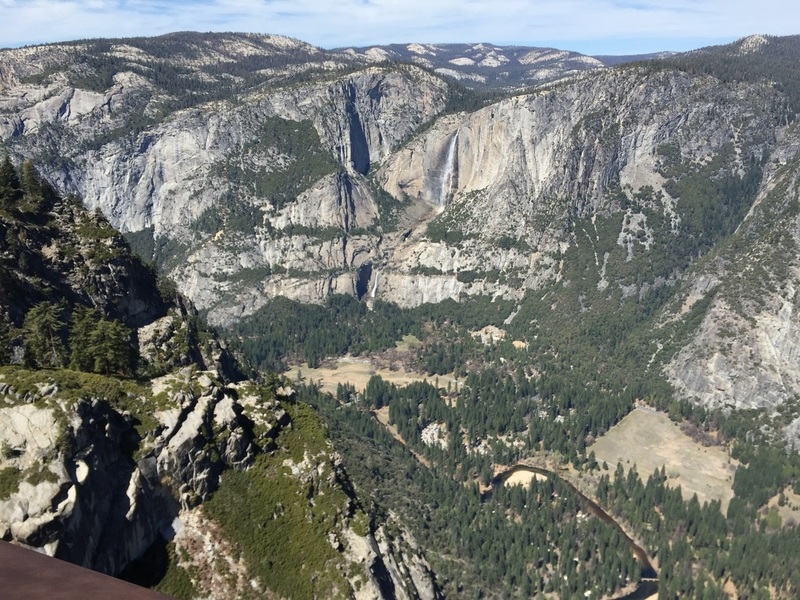 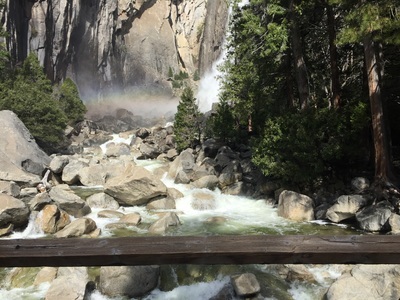 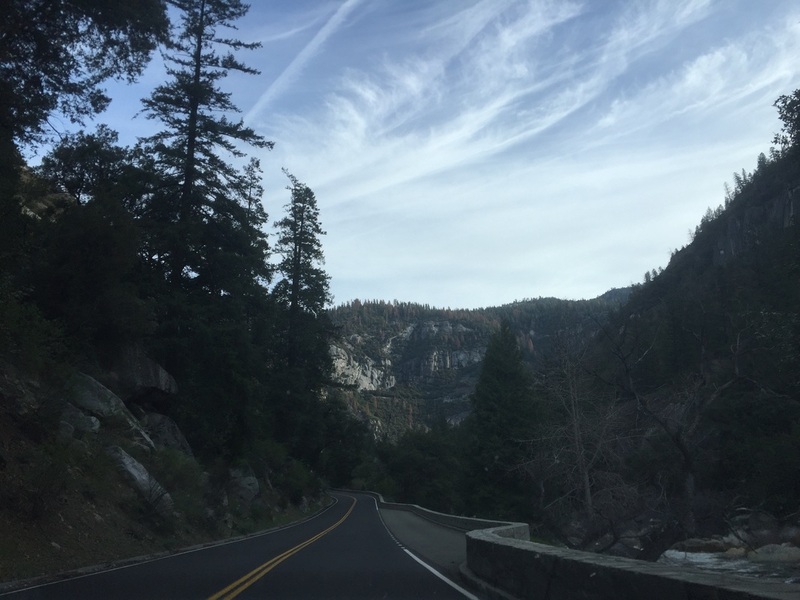 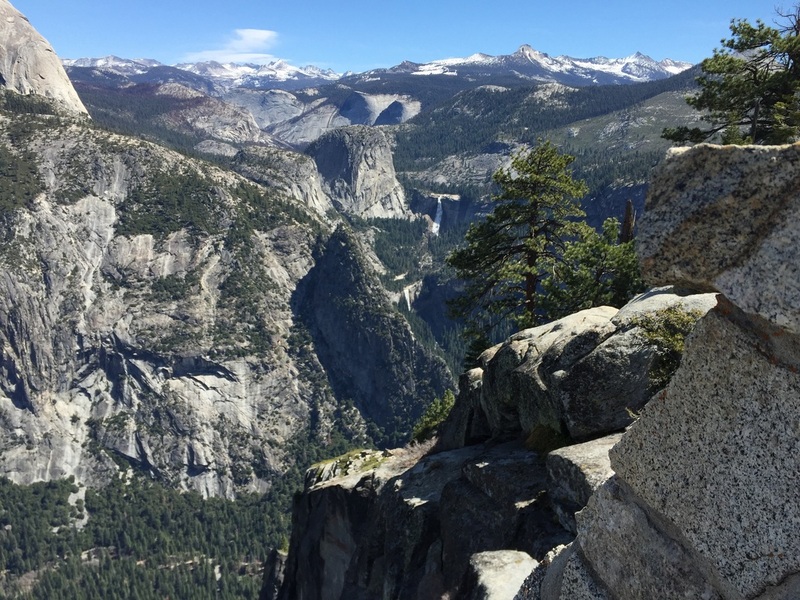 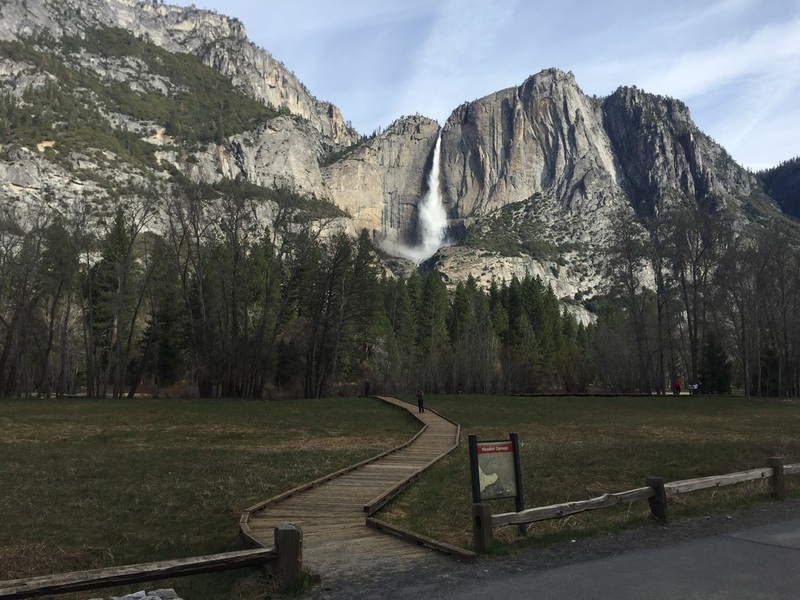 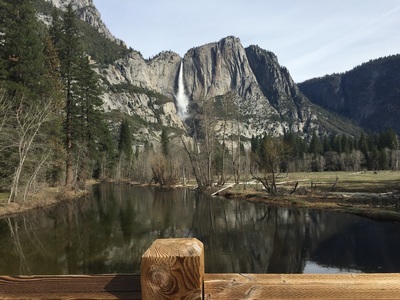 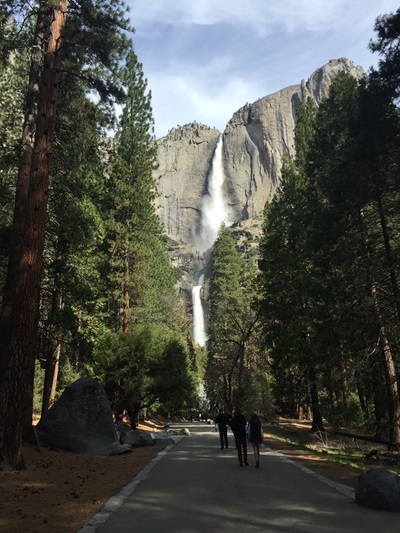 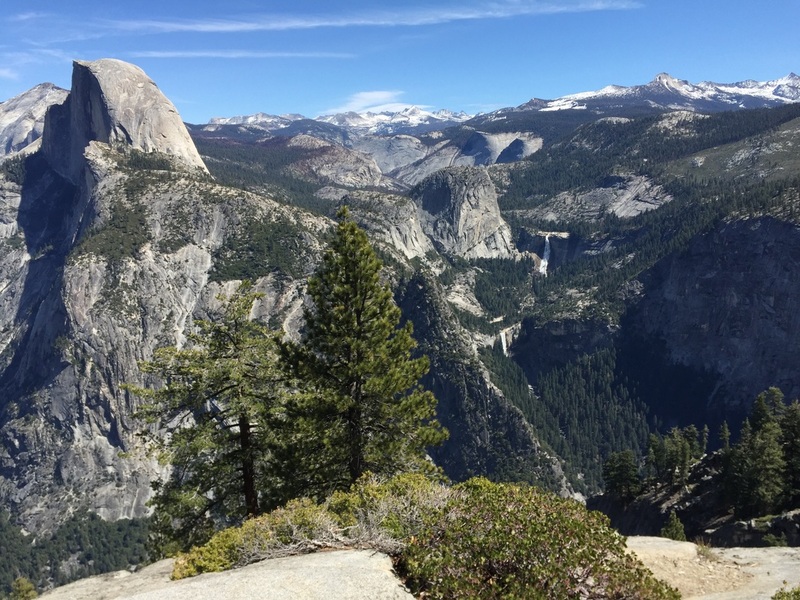 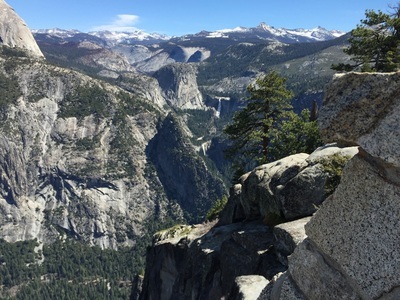 There are spectacular views of the valley, Half Dome, Yosemite Falls, Vernal Falls, Nevada Falls and Clouds Rest. 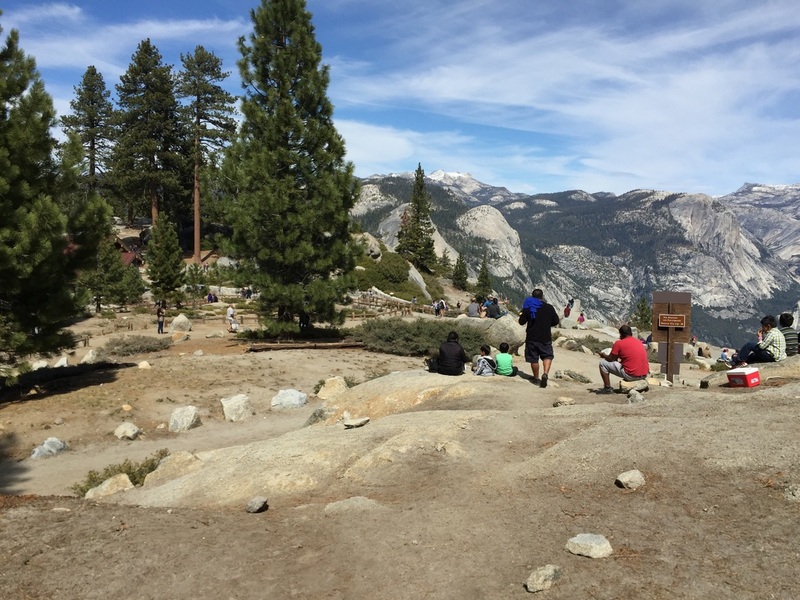 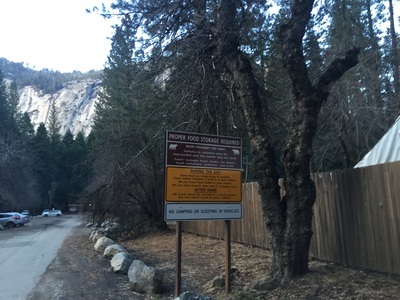 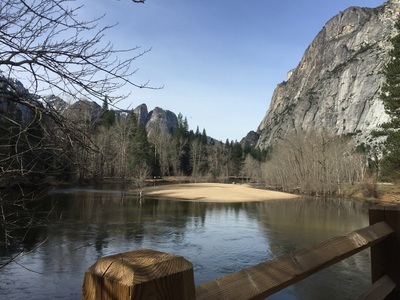 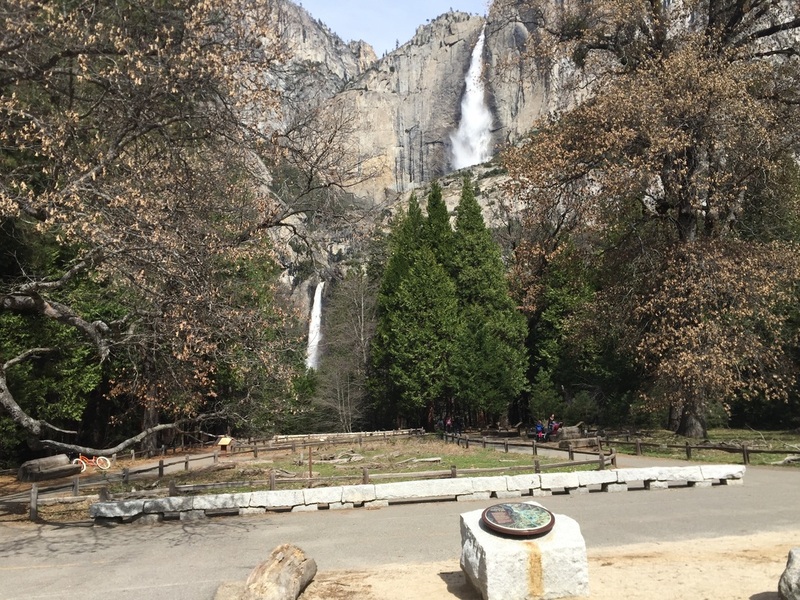 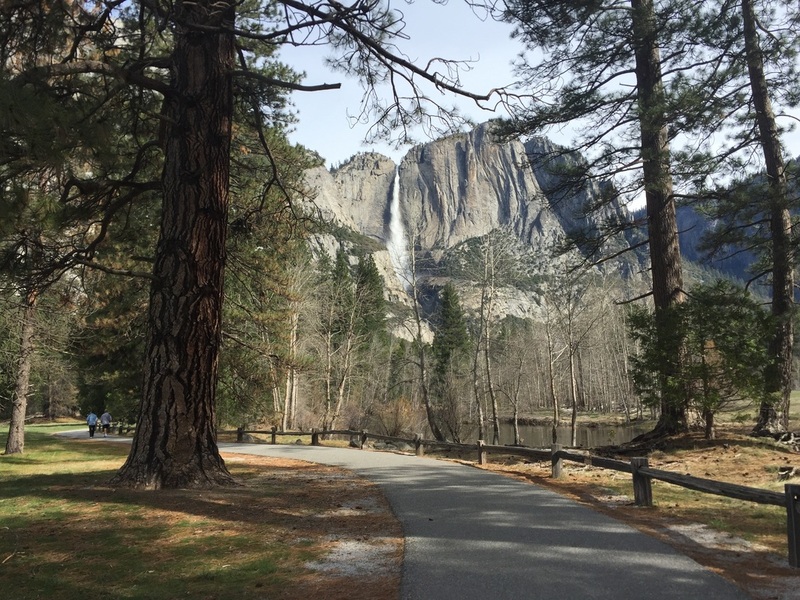 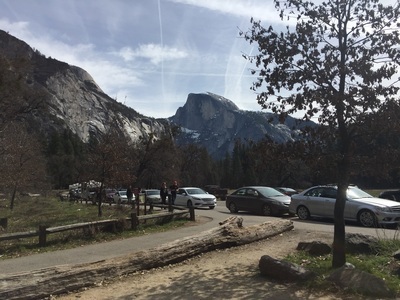 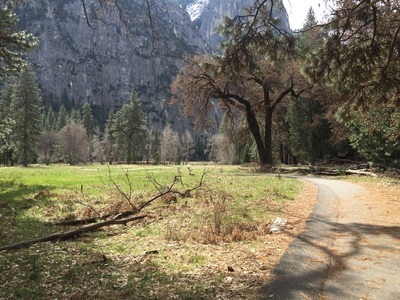 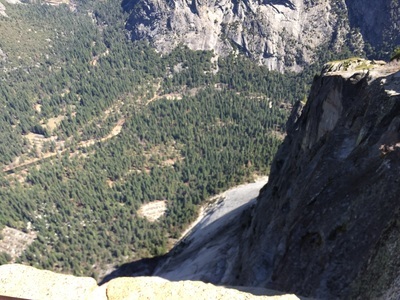 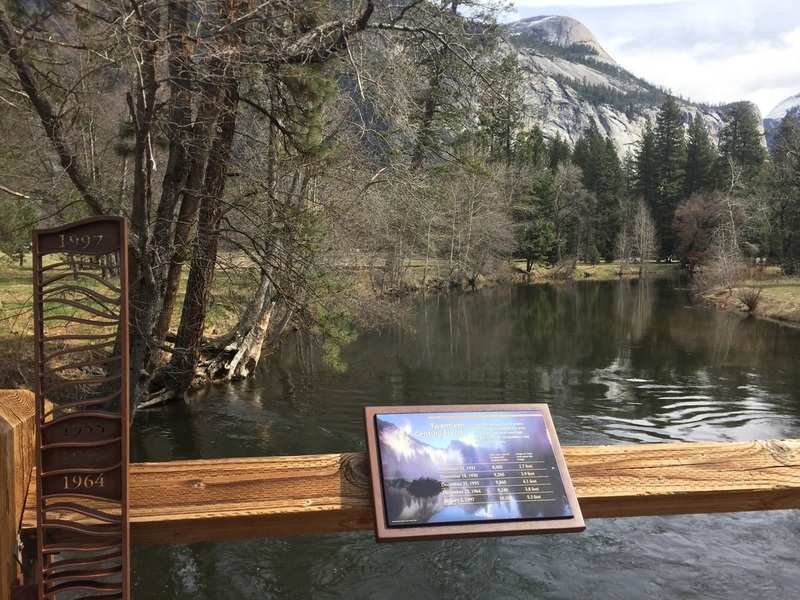 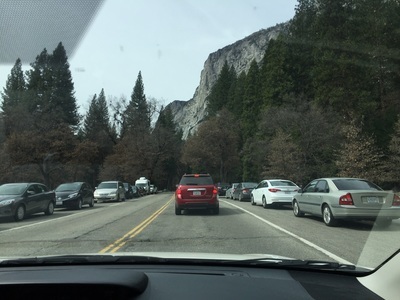 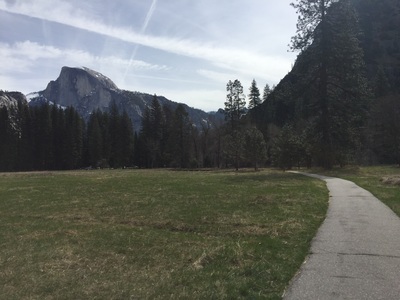 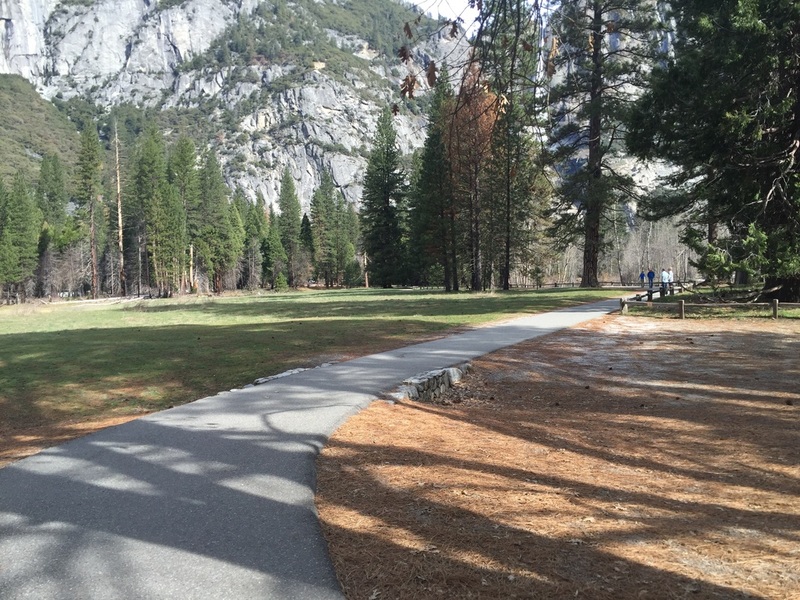 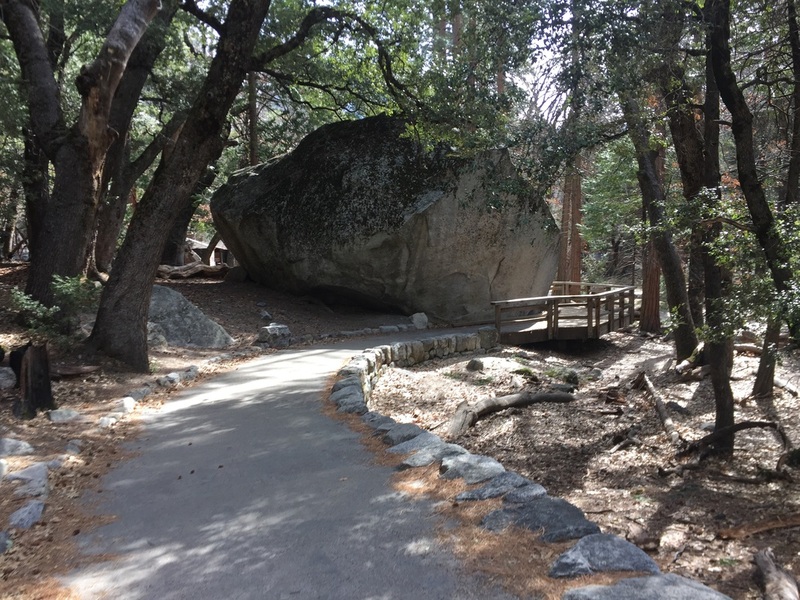 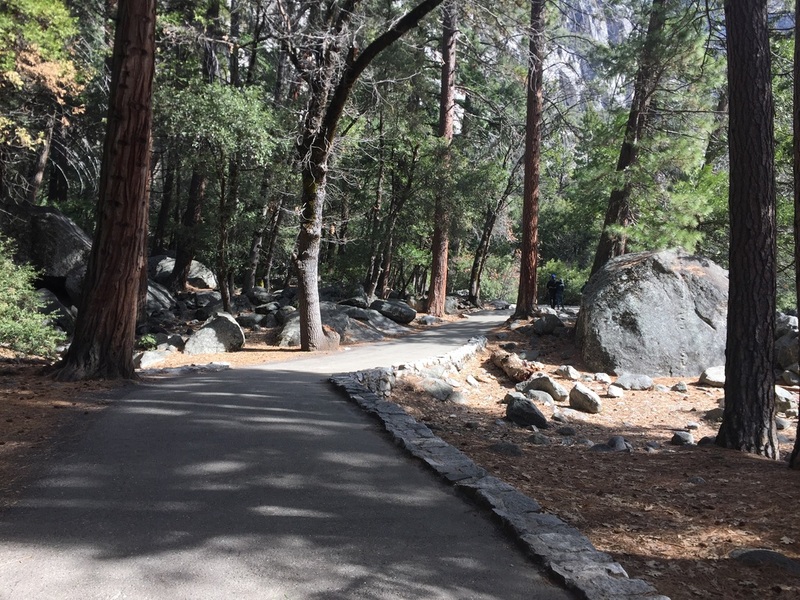 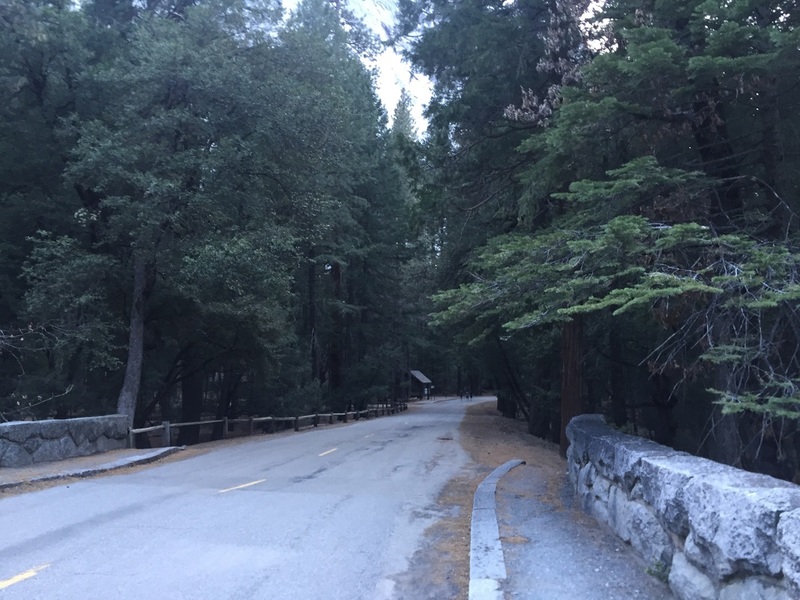 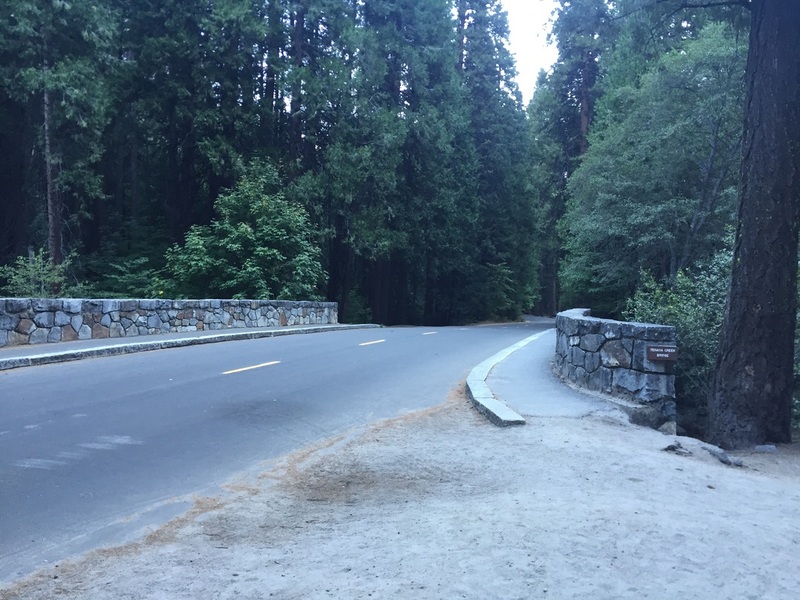 Note: Glacier Point & Tioga Roads are closed in winter. 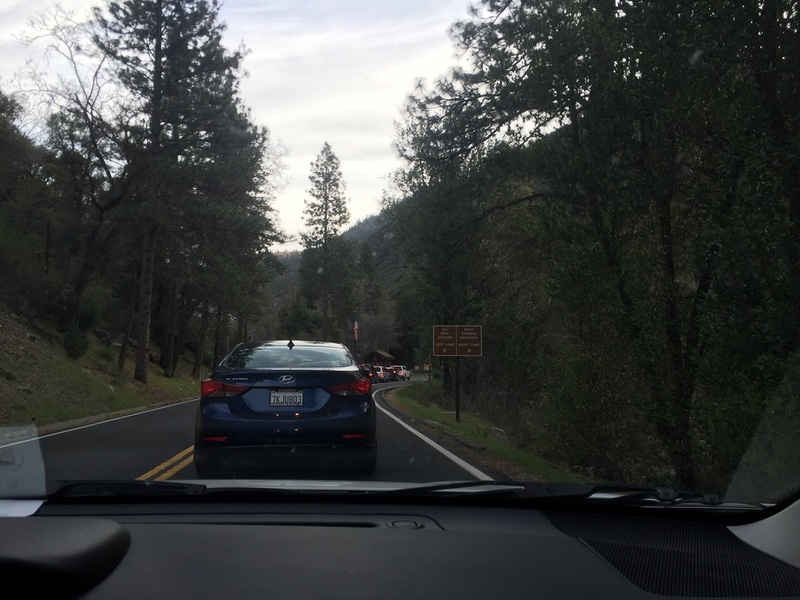 The roads usually open around April or May and close again in November. 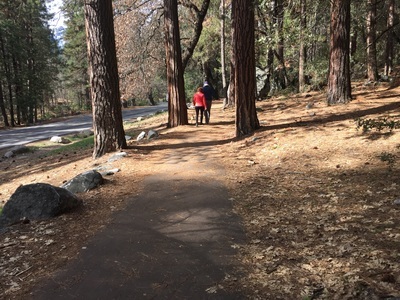 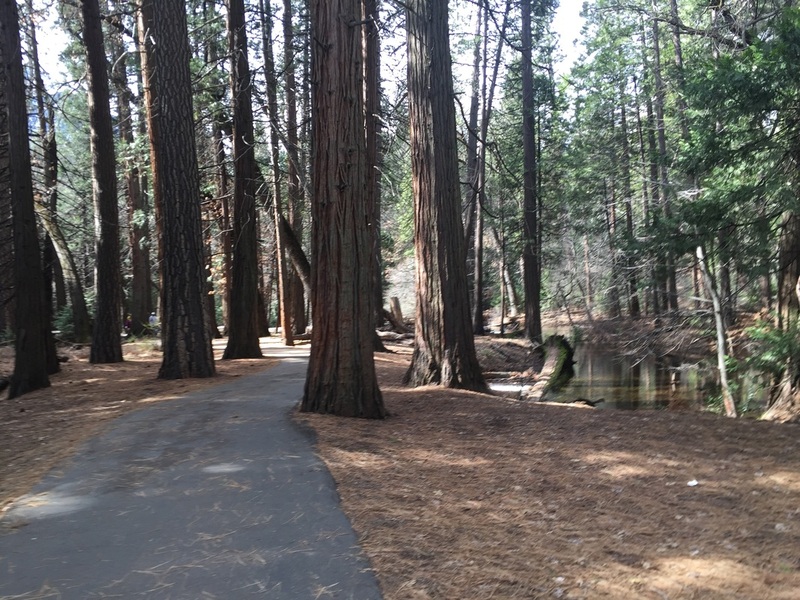 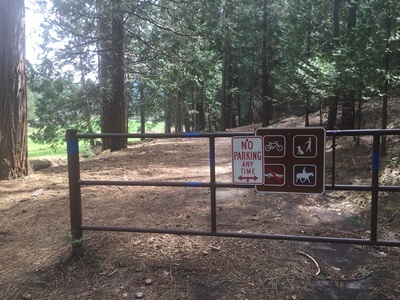 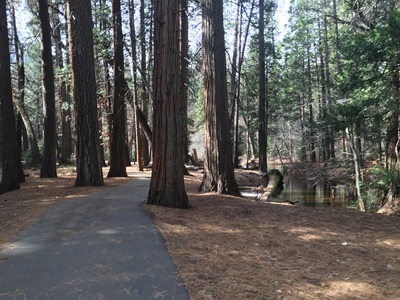 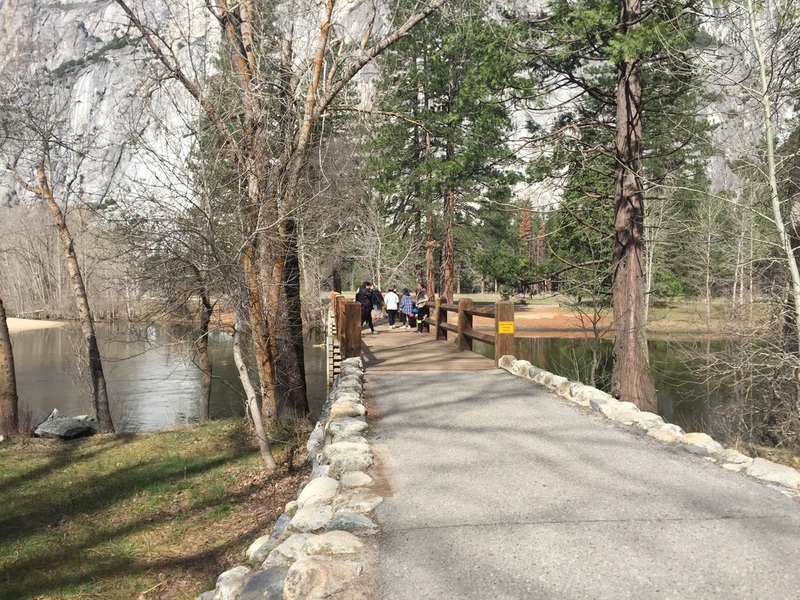 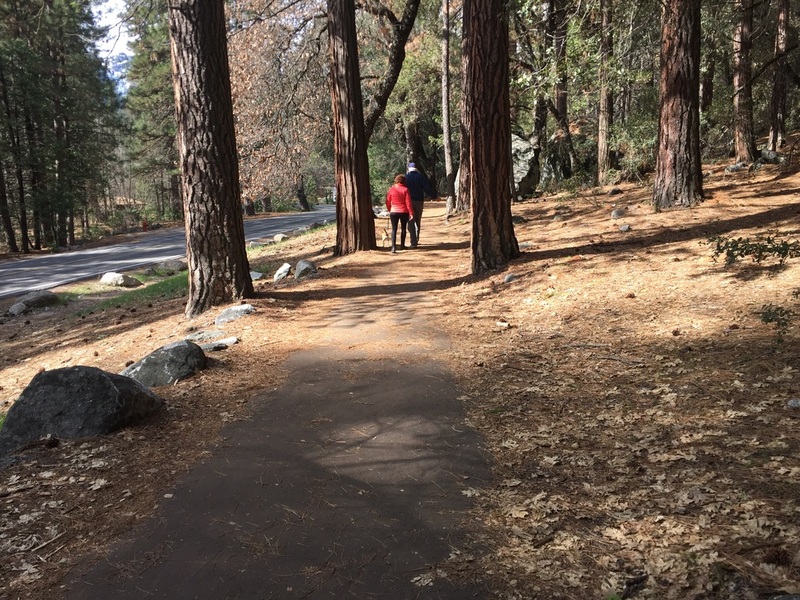 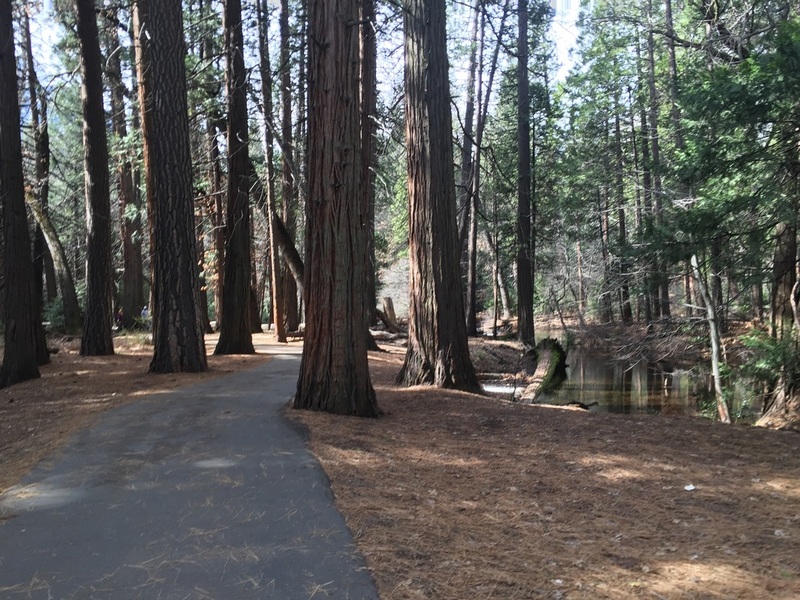 Mirror Lake: Dogs are allowed on the paved first mile of the Mirror Lake trail. 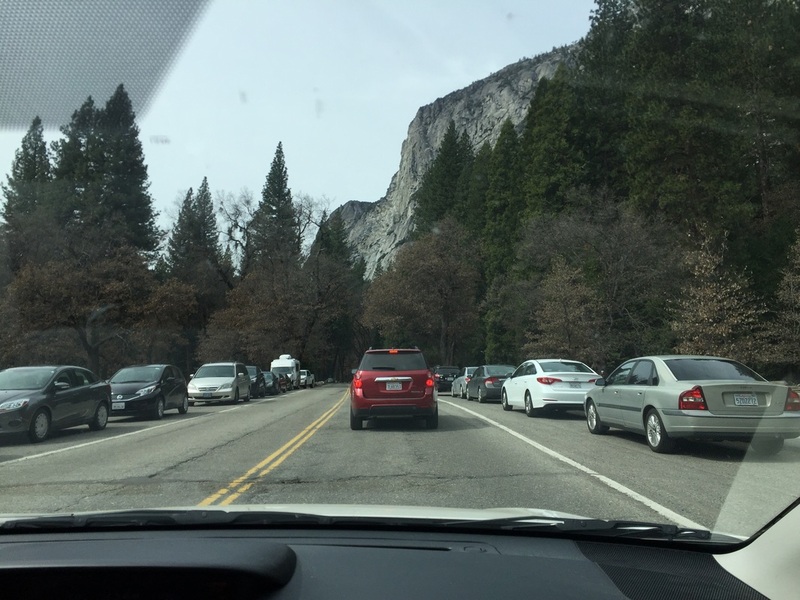 This is a roadway that is blocked off to most traffic except busses and park rangers. You may see a bus pass every 30 minutes or so up to the Mirror Lake stop #17. 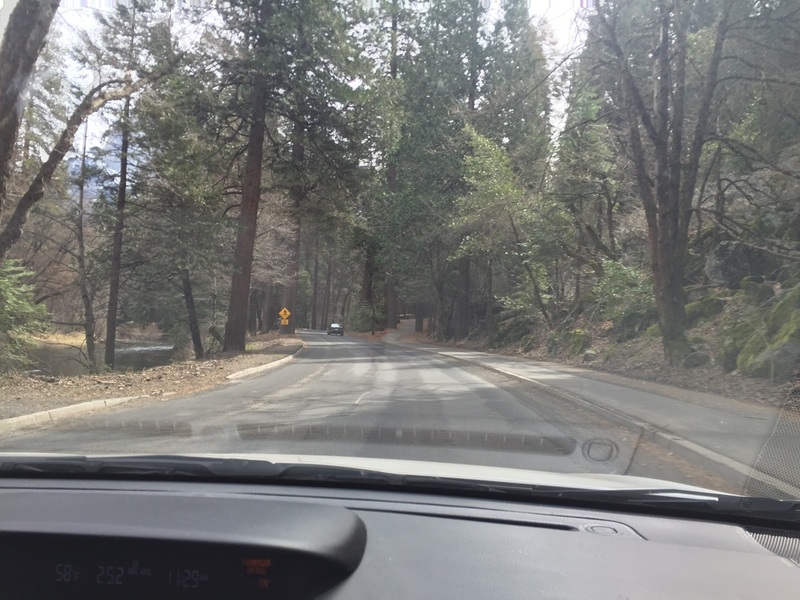 After this point, we did not see any vehicles. There is no parking at the trailhead. 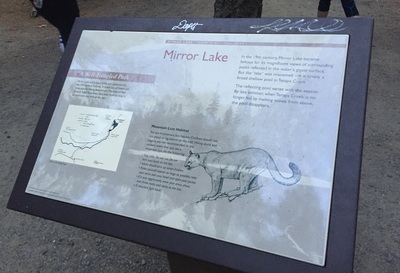 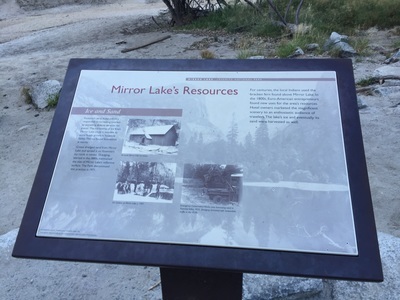 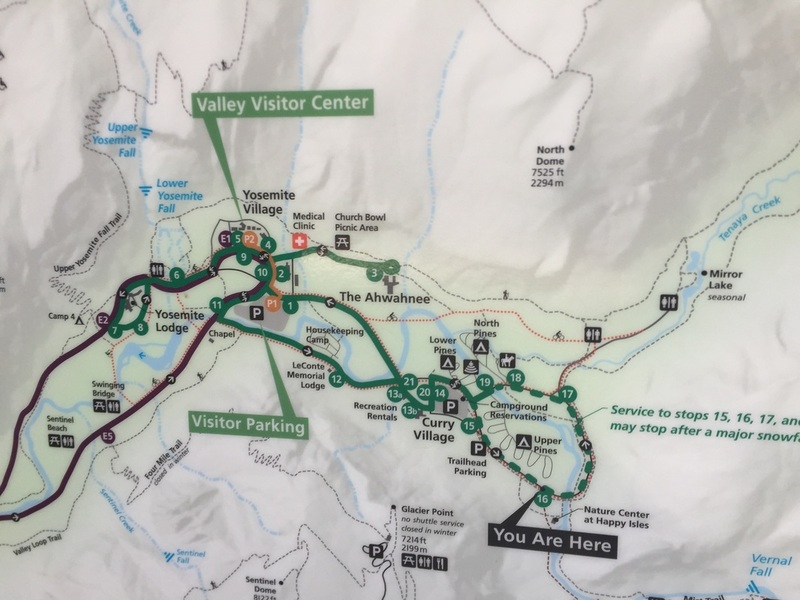 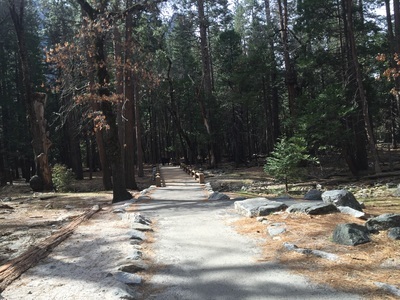 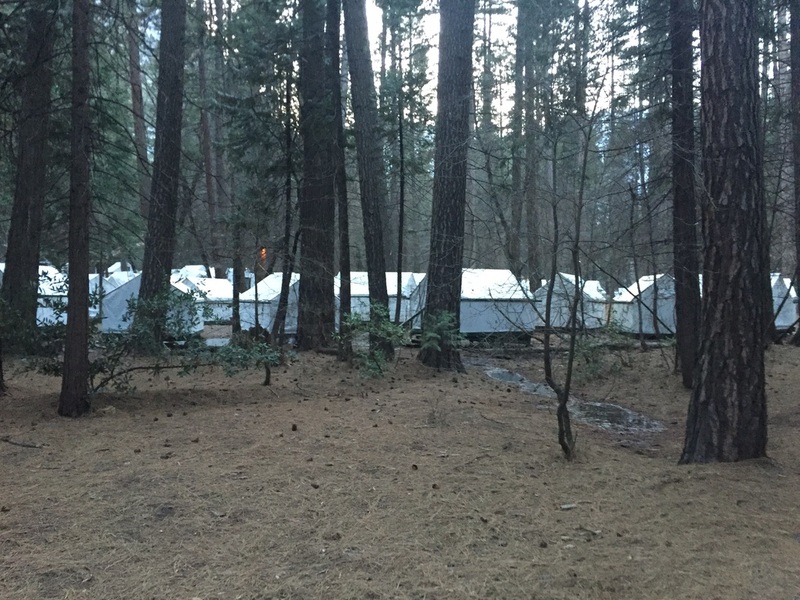 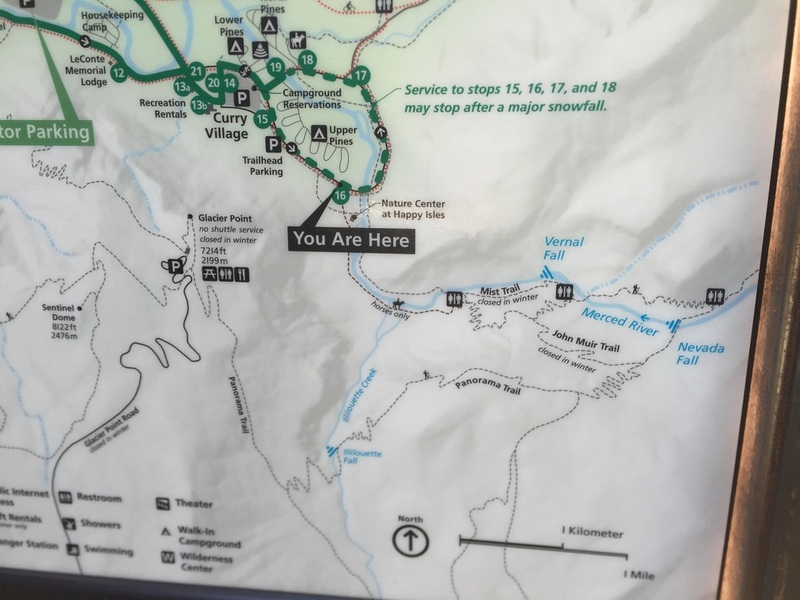 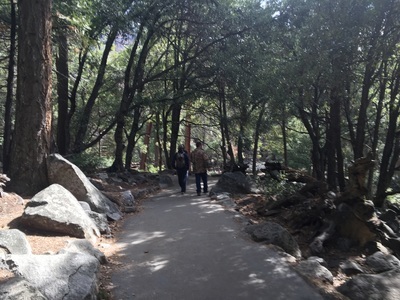 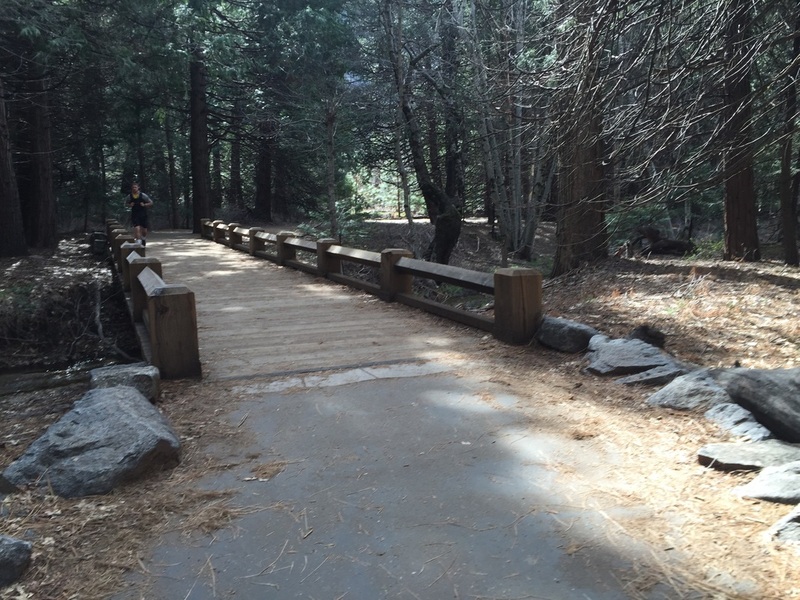 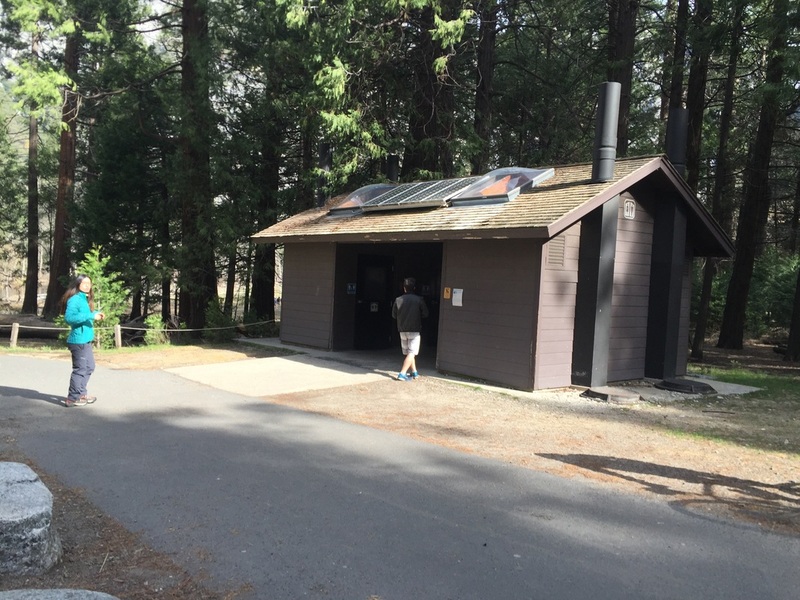 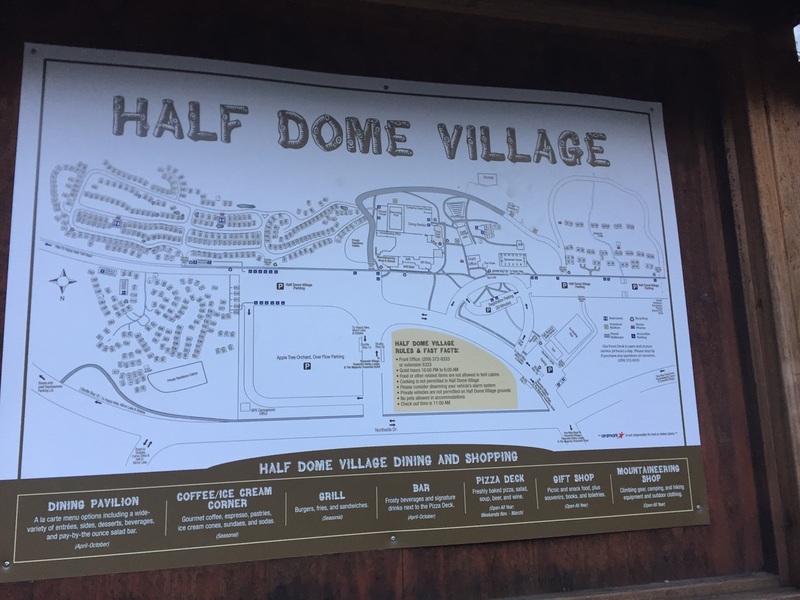 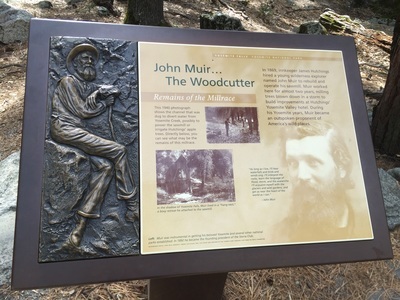 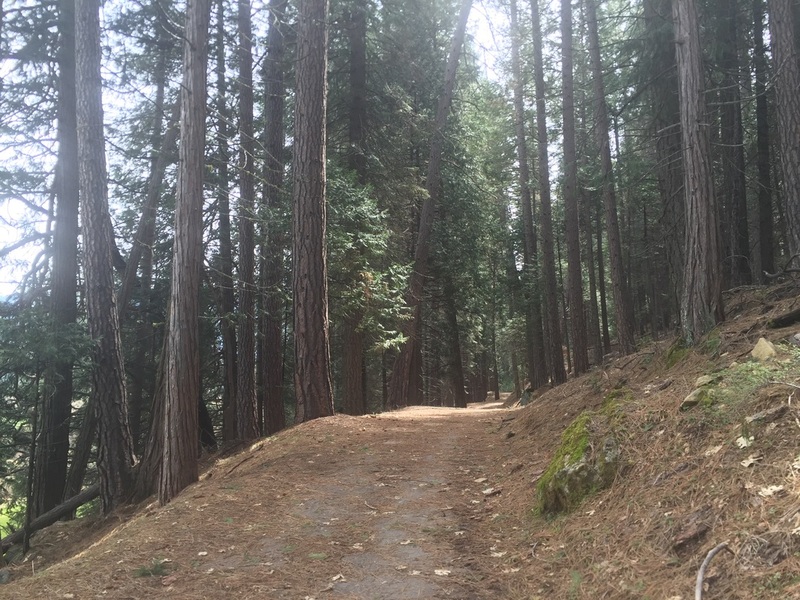 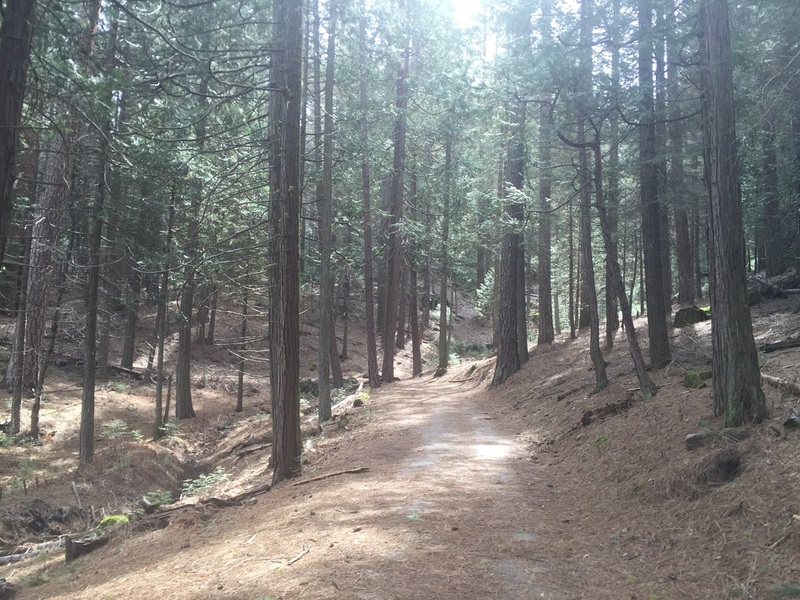 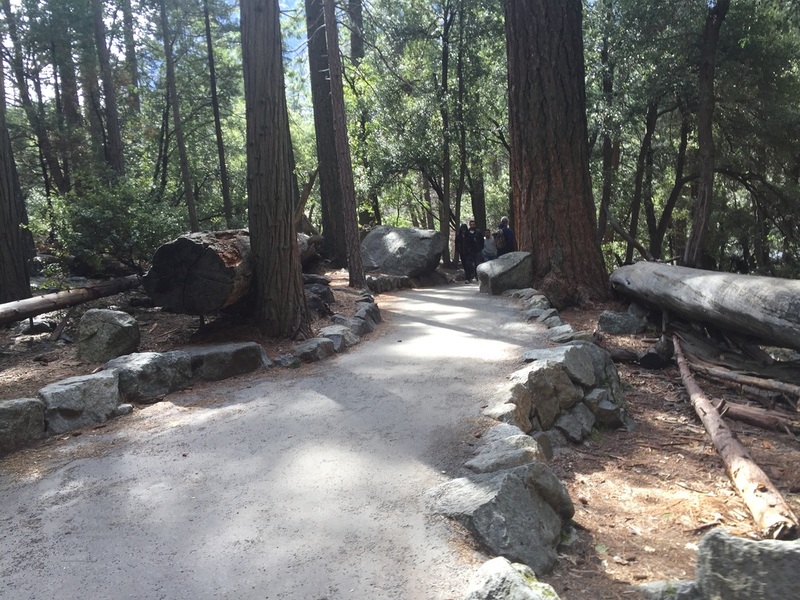 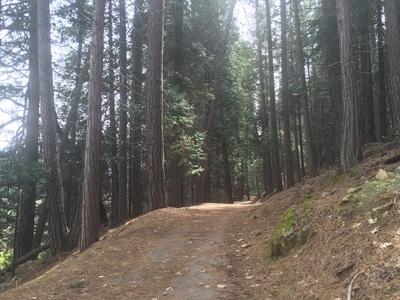 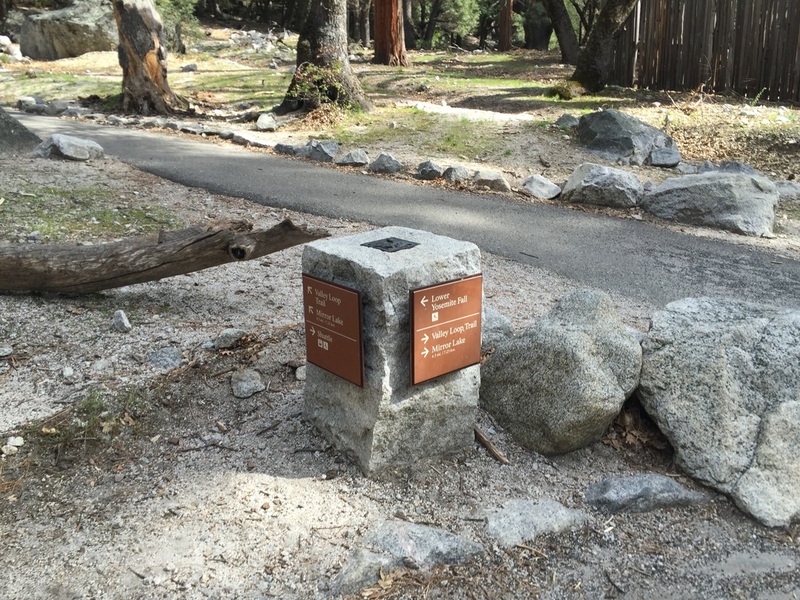 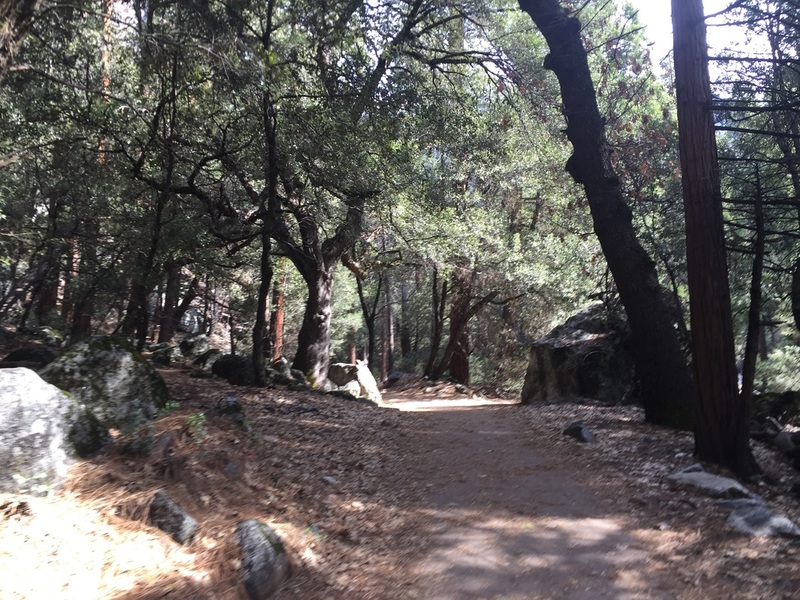 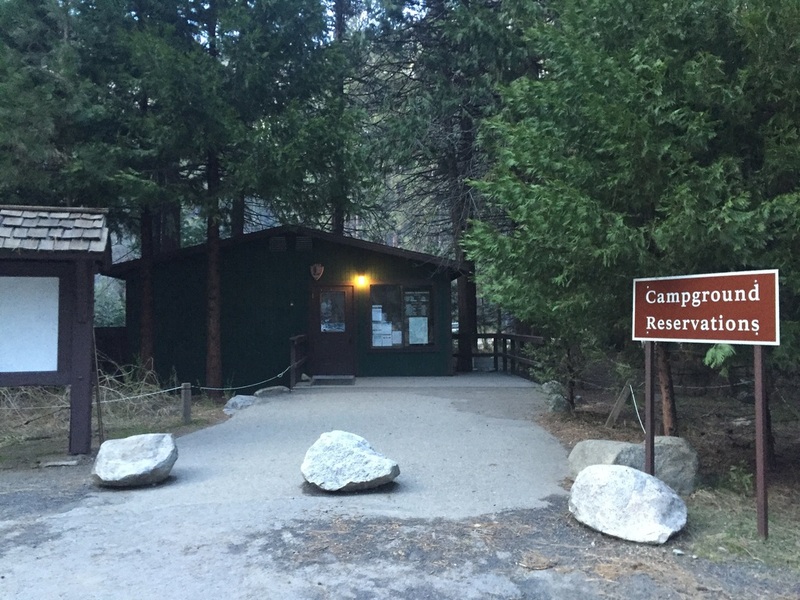 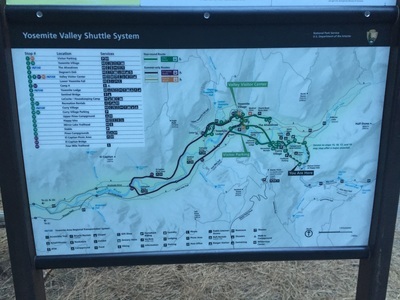 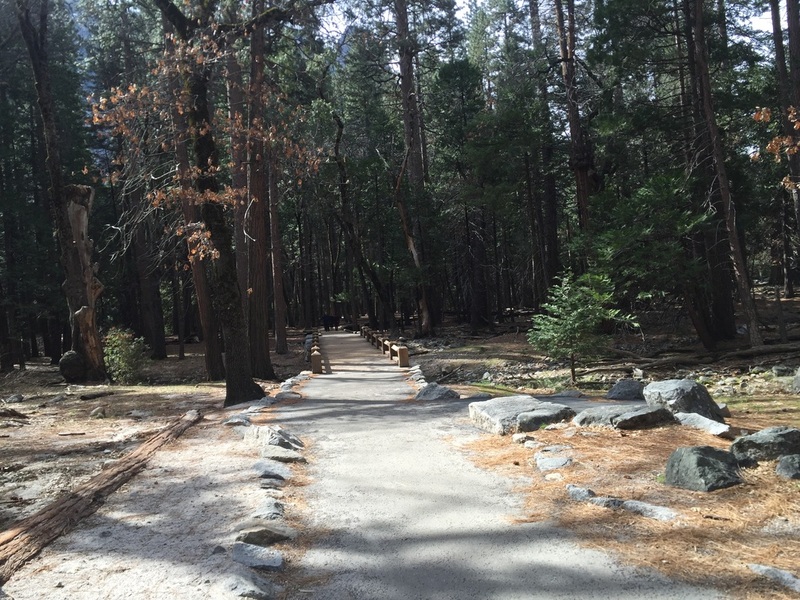 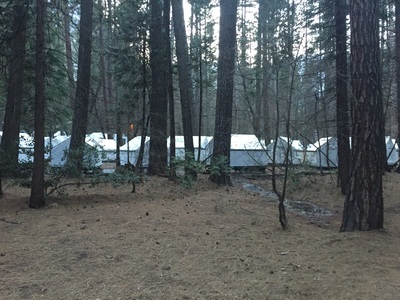 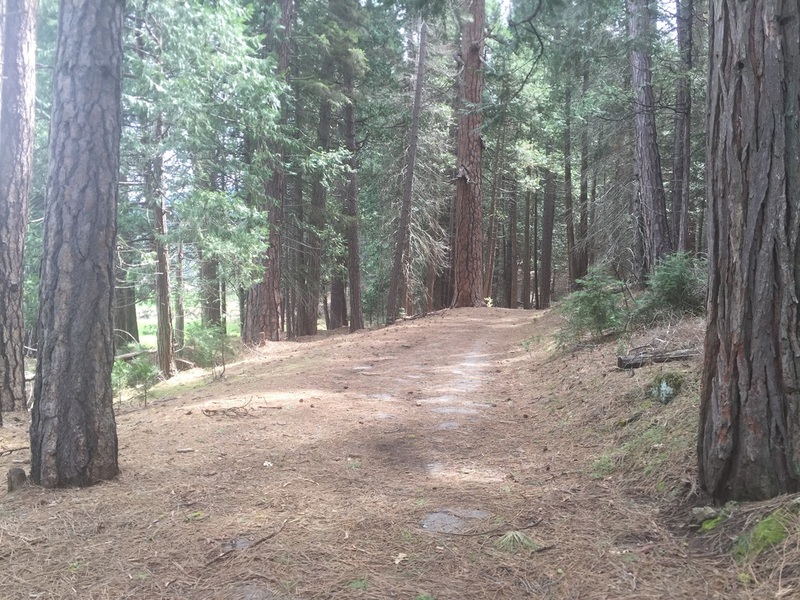 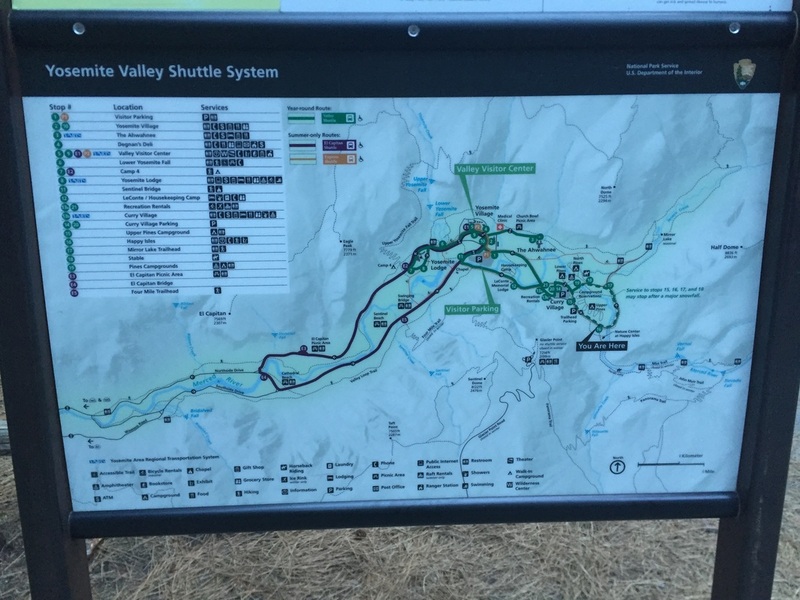 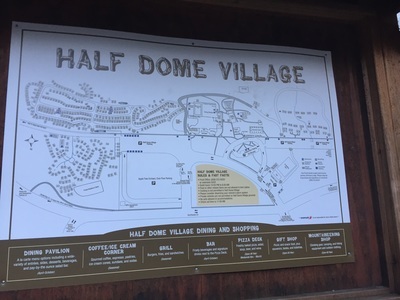 It's roughly a 1-mile hike from Curry Village to the Mirror Lake Trailhead. 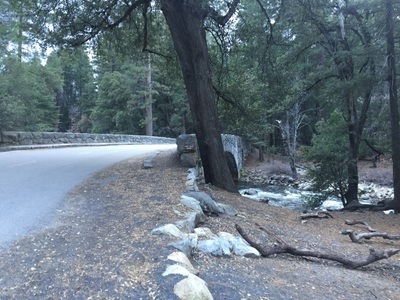 Follow the road up another mile, which crosses a bridge and skirts along the river. After a mile you will reach the Lower Pool of Mirror Lake. 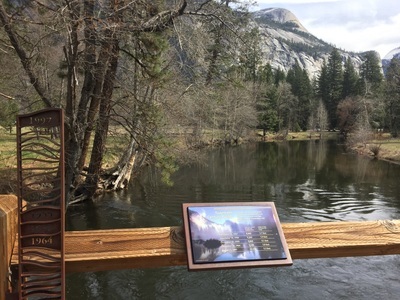 A dam separates this from the larger Mirror Lake. 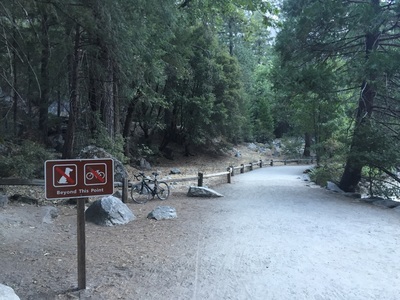 Unfortunately the viewpoint at the Lower Pool is where the pavement ends, and the remainder of the trail is not dog-friendly. 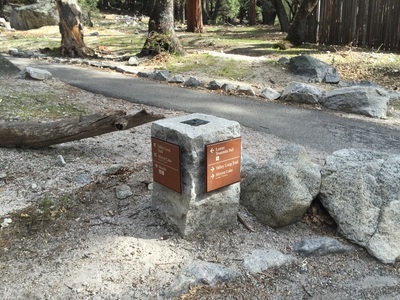 There are pit toilets to the right of the trail. 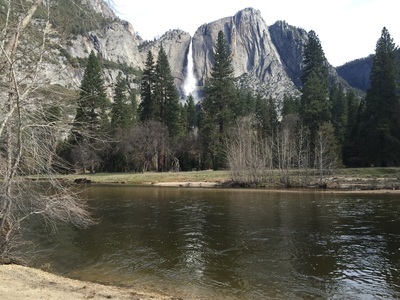 This lake varies in water level throughout the year, but has a beautiful meadow backdrop and reflections of the cliffs. 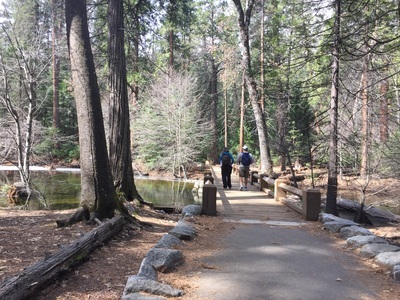 The Lower Pool will most likely be completely dry in summer months, so visit during winter or spring for a more scenic hike. 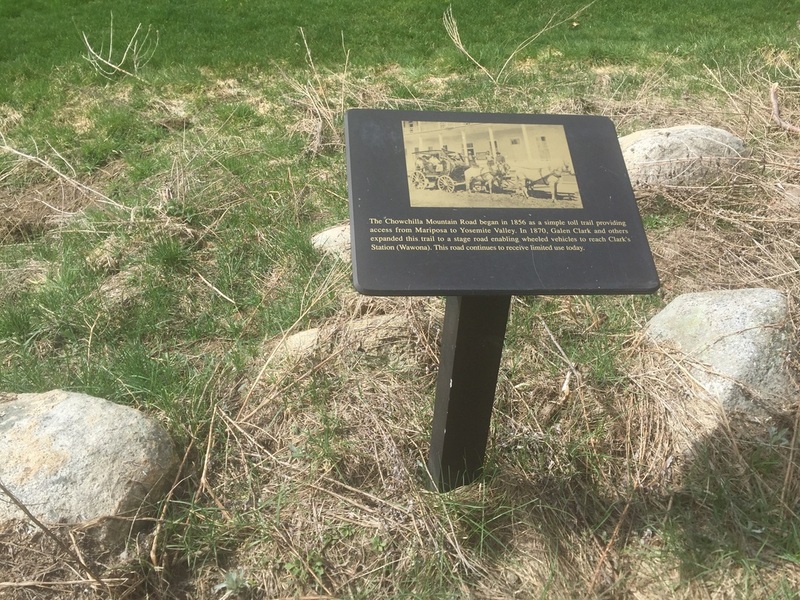 Picnic areas: Dogs are allowed in most picnic areas. Hotels: Dogs are allowed at Yosemite View Lodge for a fee of only $11 per night. This hotel is outside of the park, but it’s the closest to the park. 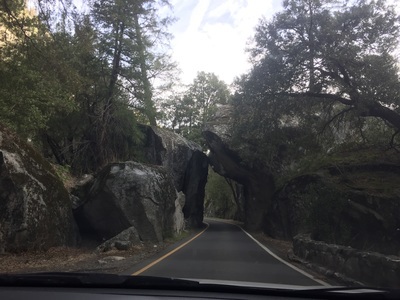 It is only about 2.3 miles from the entrance off of CA-140. 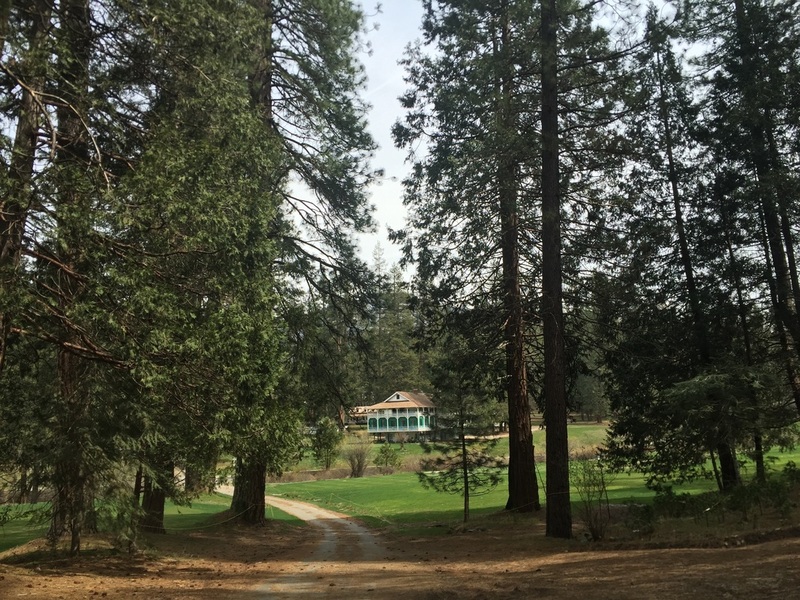 Kennel: I am not a fan of kennels, but there is a 9-stall dog open-air kennel at the Yosemite Valley Stables if absolutely necessary. 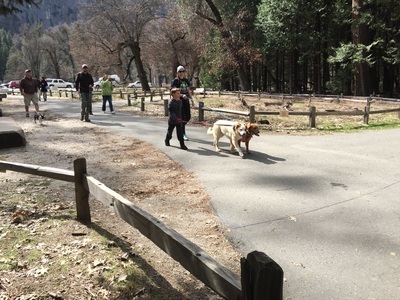 You should take your dog on one of the walks mentioned above first, as the kennel does not exercise pets. This kennel is open from May 30th (Memorial Day)- September 5 (Labor Day). 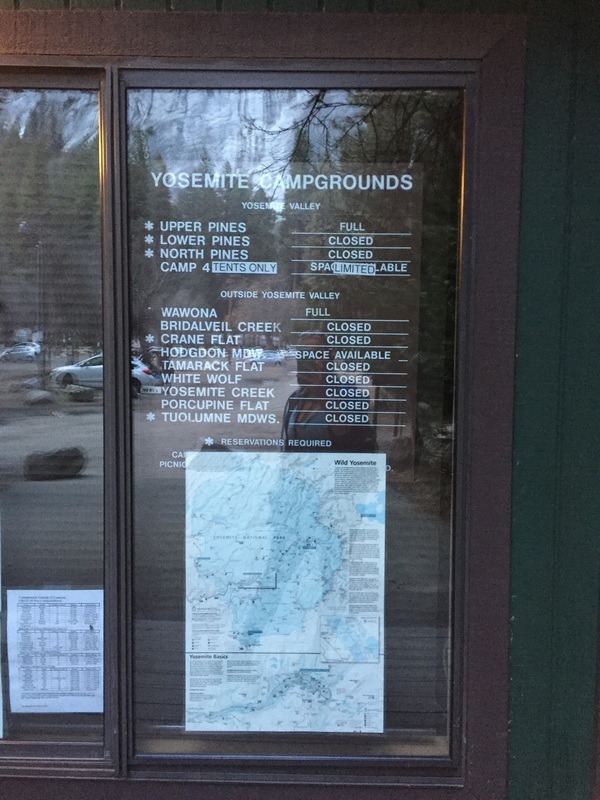 You should contact them ahead of time because they have a lot of restrictions: Your dog should be 20+ lbs, you need to show written proof of immunizations (rabies, distemper, parvo & Bordetella) and it’s first-come, first-served (with only 9 stalls there’s no guarantees of availability). 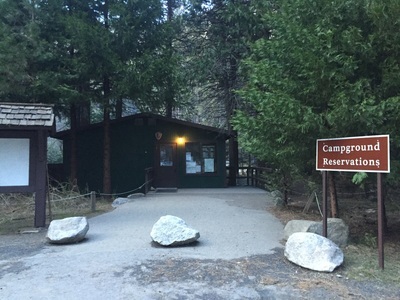 You need to bring a dog bed, pets are fed at 4pm daily and visiting hours are from 8am-5pm. 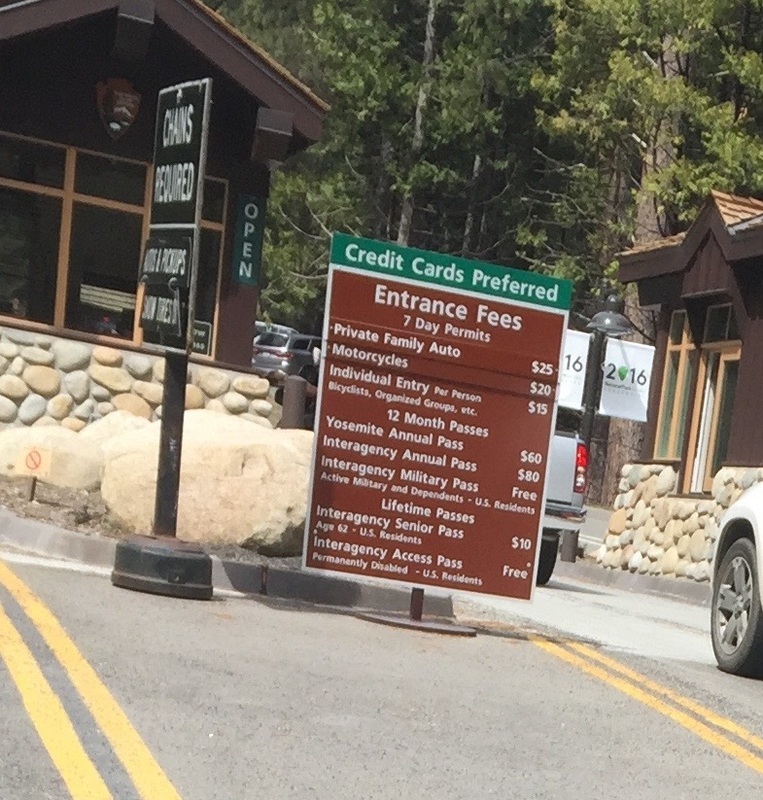 Fee is $8 per day. 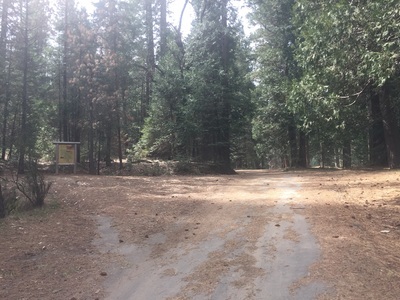 Call (209) 372-8348 for more information.